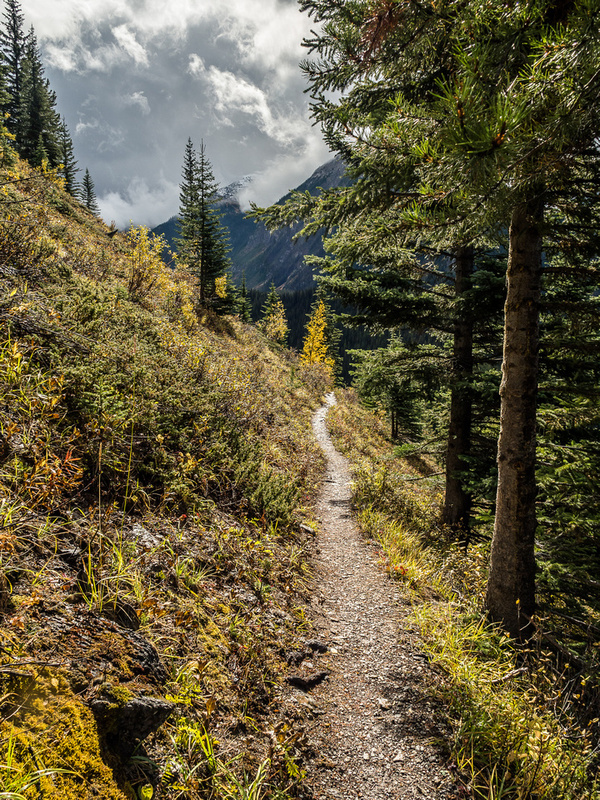 Difficulty Notes: This is a long, difficult hike through remote and rugged terrain but the trail is excellent and the views should keep you entertained enough to forget about your sore shoulders and feet. 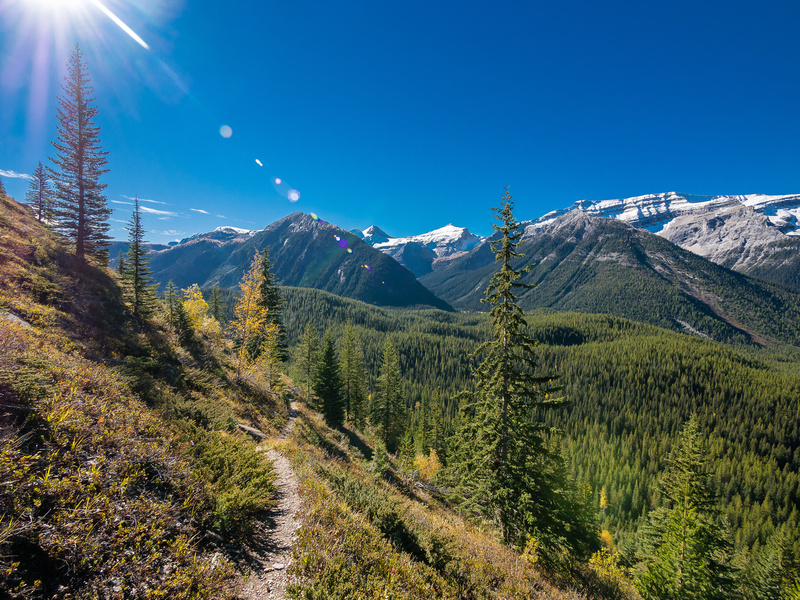 The heavier your pack and hotter the sun, the less you’ll enjoy this world-class trek! 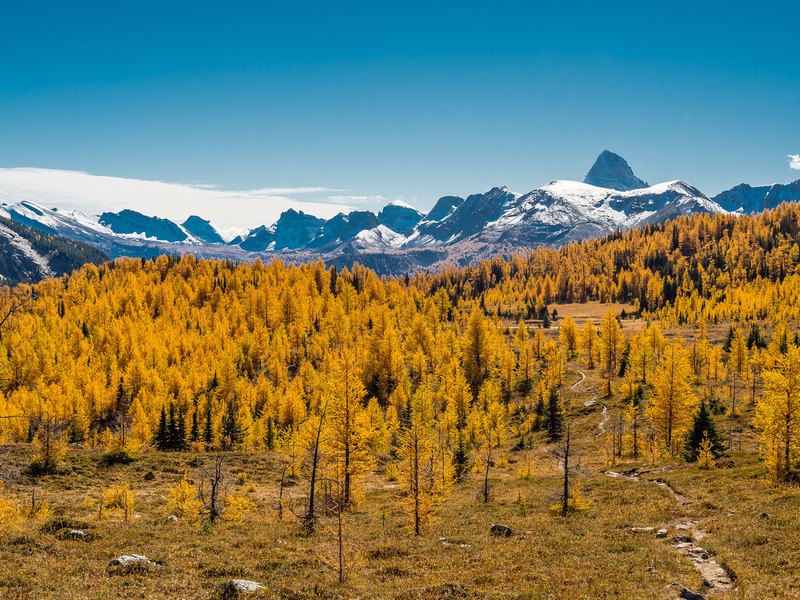 Ever since I first backpacked into the Mount Assiniboine area in early September 2008 from Mount Shark, I’ve wanted to go back in larch season – sometime in the last two weeks of September. 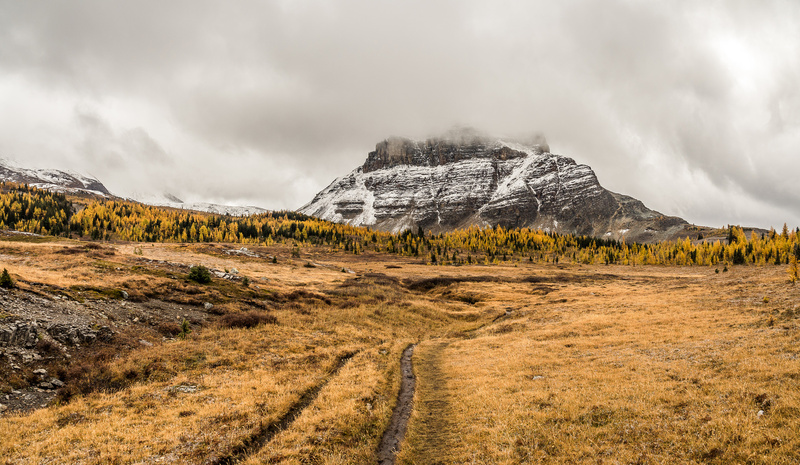 I did go back to the area on September 22, 2012 but avoided most of the larches by going in via Settler’s Road and Assiniboine Lake before climbing Mount Assiniboine and Lunette Peak from the Hind Hut and returning via the same route. In 2015 I thought I’d be going back and for some reason or another it didn’t pan out. In 2016 I was absolutely determined to make the hike and scramble trip work out. When the dust finally settled, it turned out that if I wanted to do this trip I was going to have to do it solo. Such is life. I’ve done many solo trips over the years and I was OK with it for this one too. I settled on some dates where the weather was looking pretty fine and reserved a seat on the earliest departing Sunshine Meadows Bus to save myself 500m of elevation gain and 6.5km of approach distance. Boy, am I glad that I did that! 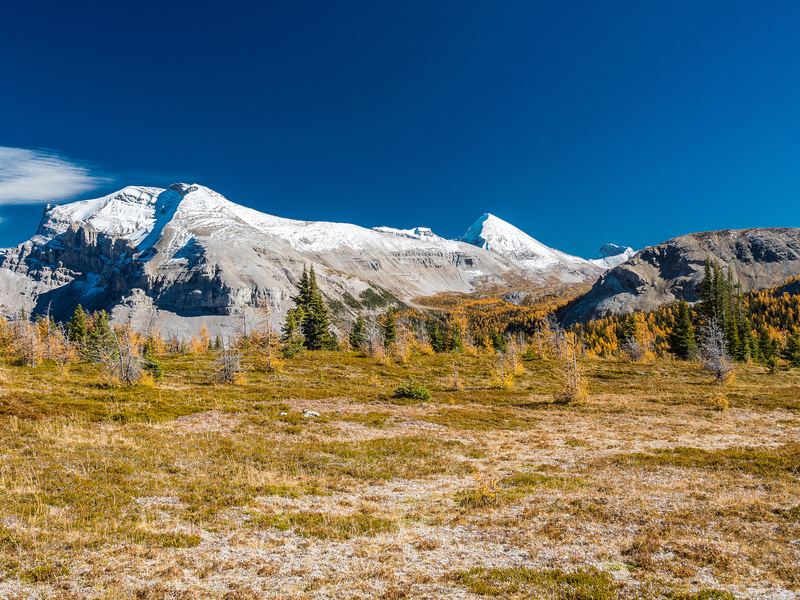 Banff Sunshine Meadows to Mount Assiniboine Route Map – Add another 500m of elevation gain and 6km if you don’t take the bus or gondola to the meadows from the parking lot. Right up front I’ll say that especially if you’re not using the approach bus, you should seriously consider *not* doing the entire ~30km approach from Sunshine Village in one day. Despite me doing the approach in under 8 hours, I think most folks will find it pretty difficult – much harder than implied on the Assiniboine Lodge’s web site which incorrectly states the distance as 27km and much more egregiously lists the total height gain as only being 400m. They also seem to encourage helicopter access which is disappointing. I’m sure I’m not the first experienced backpacker to arrive at Lake Magog swearing that we’ve never felt so exhausted doing 400m of height gain before! 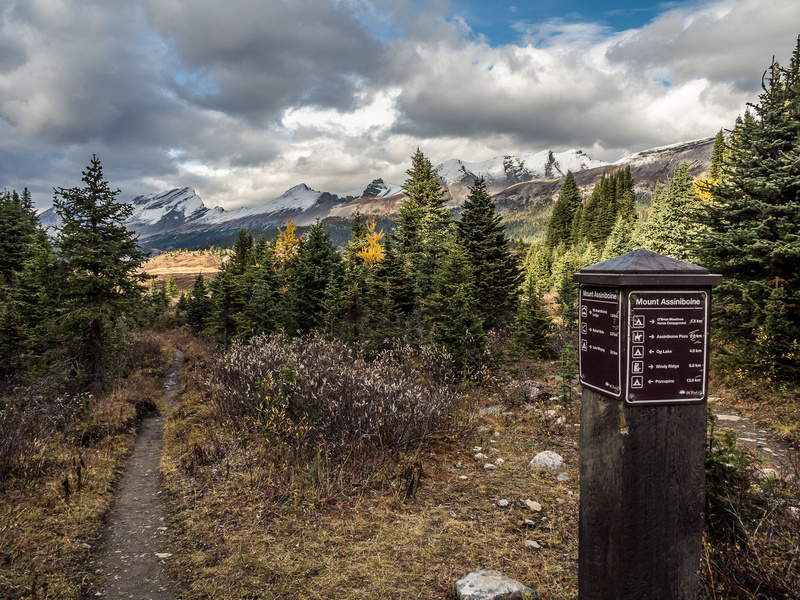 Also note that whether you’re using Citadel Pass as an entry or exit to the Mount Assiniboine area, the total height gains are about the same – you will work just as hard going out as coming in. This is not the case for any of the other approach routes to the area. 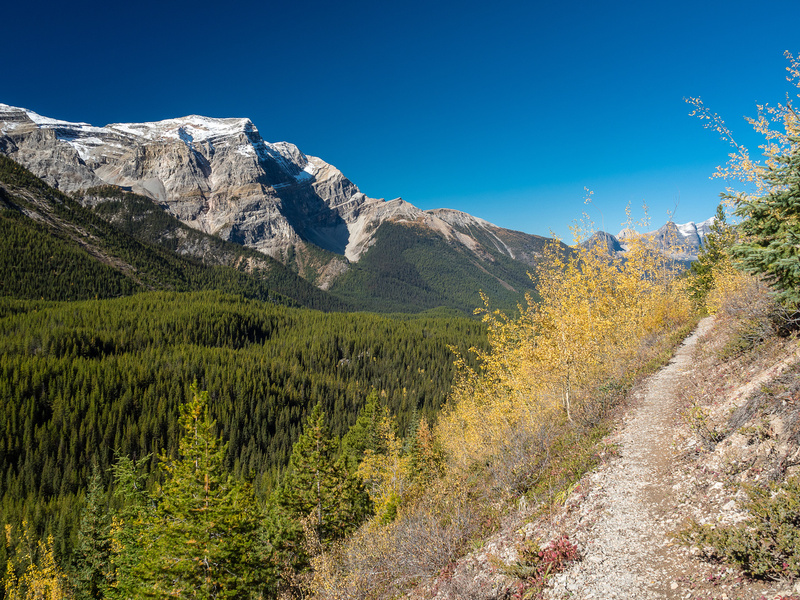 Do not underestimate the mental and physical effects of gaining and losing elevation repeatedly on this route – and at least 12-16km of it without a drop of easily accessible drinking water! 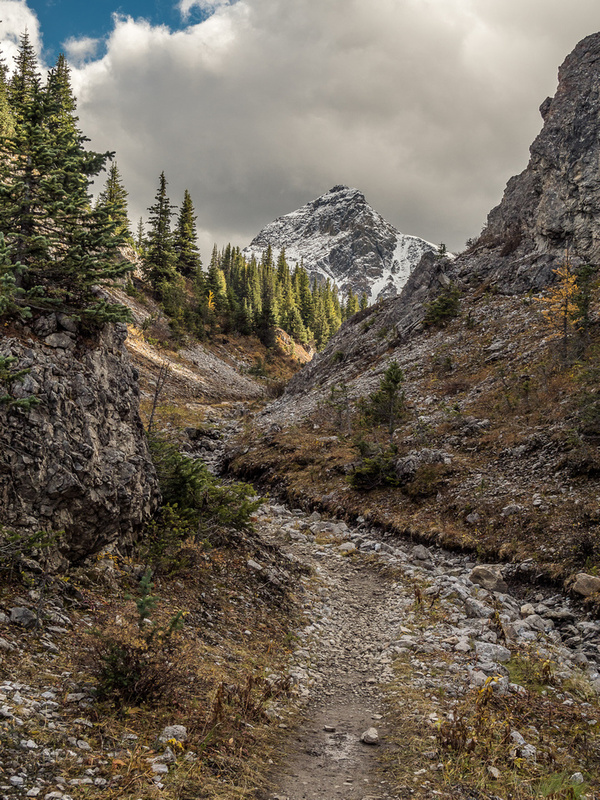 One last thing to consider is that this route is fairly exposed to the elements compared to the other classic approaches (Assiniboine or Wonder Passes) and in my opinion has a much higher chance of seeing or disturbing bears. 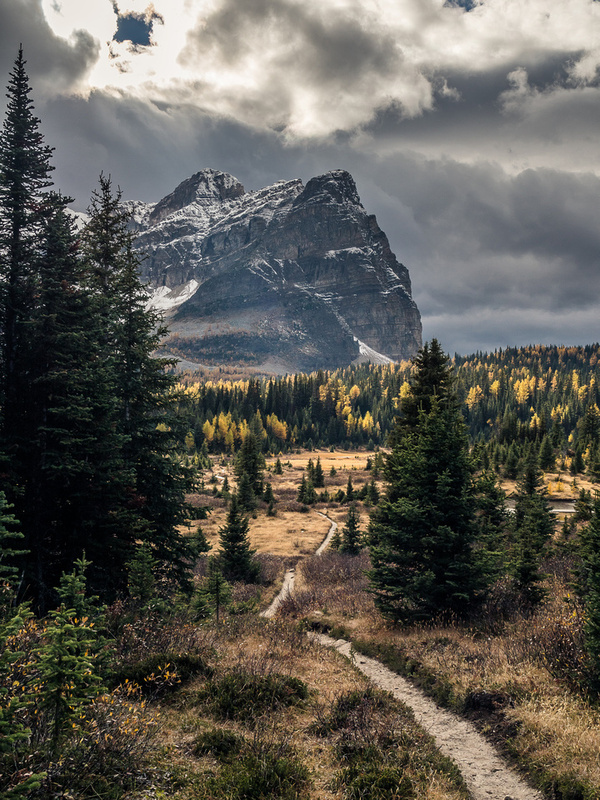 I’ve put together a summary page of all the Mount Assiniboine Provincial Park approach routes from my perspective here. 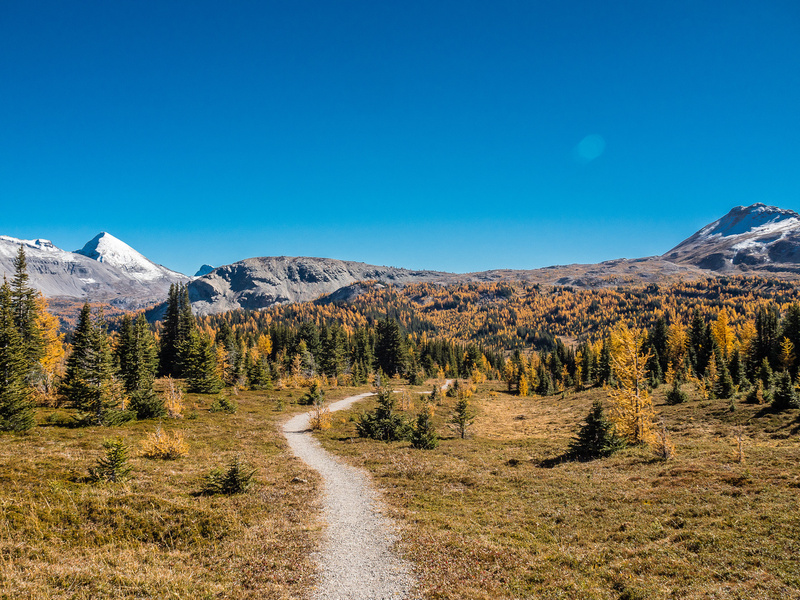 So – if the Sunshine Meadows approach has much more height gain, more exposure to weather and animals than any other route, and has no water sources for at least half the route. Why the heck would anyone want to either approach or egress this route?! “Why” is always a good thing to ask – no matter the situation – but in this case it’s also easily answered. 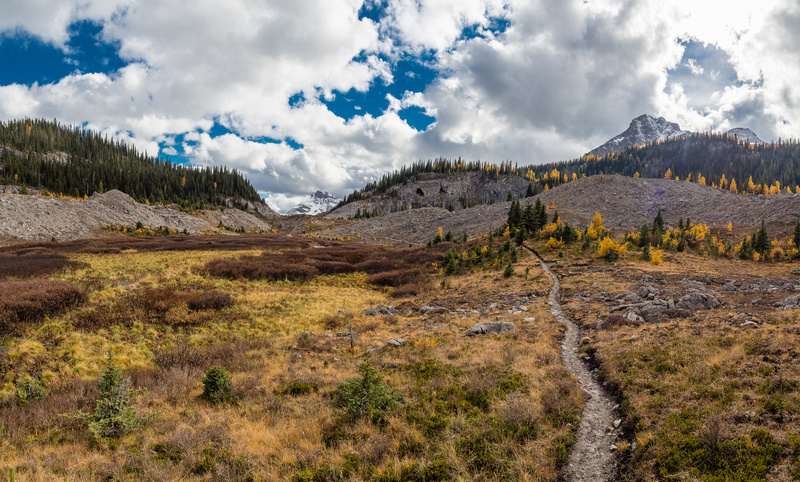 Having done most of the other popular approaches (other than the one from the air) to the Mount Assiniboine area, I can categorically state that the Sunshine Meadows route is by far the most scenic and rewarding one, especially during larch season. No doubt in my mind. I thought long and hard about taking the bus from the Sunshine Ski Resort parking lot up to the upper Sunshine Village because I detest using motorized assistance when there’s a perfectly good trail / route, but in the end I had put a lot of km’s and elevation on my body over the past few weeks and I knew it would be prudent to save myself the 6.5km of distance and 500m of height gain. I was surprised by how empty the first bus of the day was. I was also surprised that you don’t have to reserve online (as for the Lake O’Hara bus) but can do a walk-up reservation. $29 is pretty steep, but it did include a ride down too, so I kept the ticket tucked away in my pack to use on my return. (Note: In 2018 the Sunshine resort started running the gondola on weekends which is more convenient than the bus.) After a short, bumpy ride we got a short speech about bears and weather before the driver finally let us go. 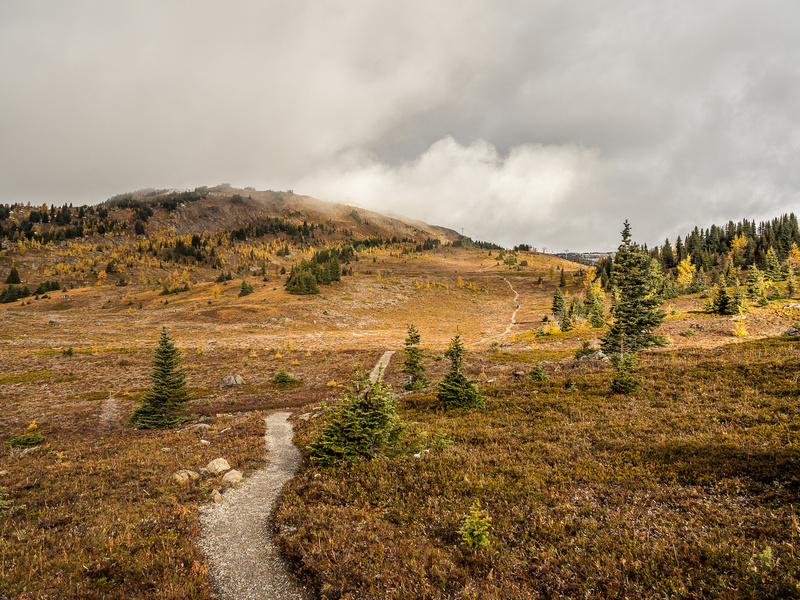 I shrugged into my heavier-than-normal backpack and set off up the trail to the Sunshine Meadows. 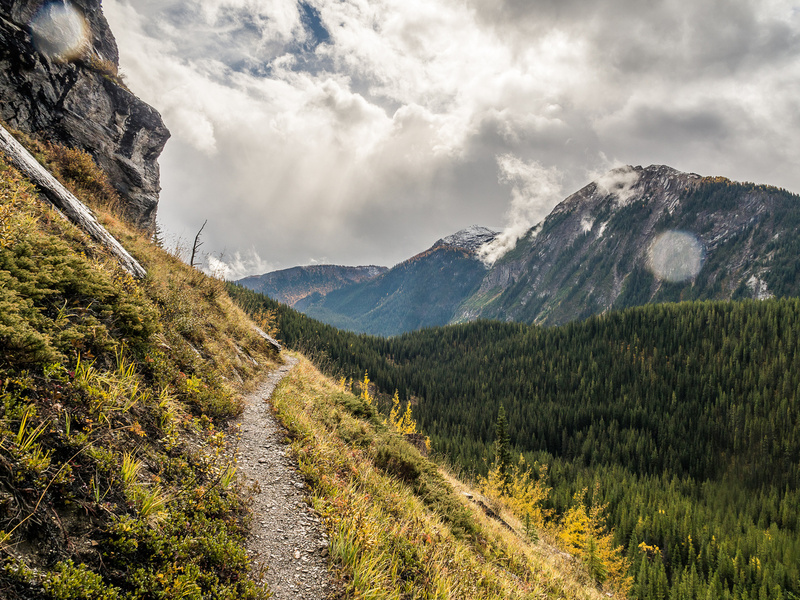 Yes, immediately I noticed that the trail went up at least 100m and I started questioning the 400m total height gain right from the start of my trek. 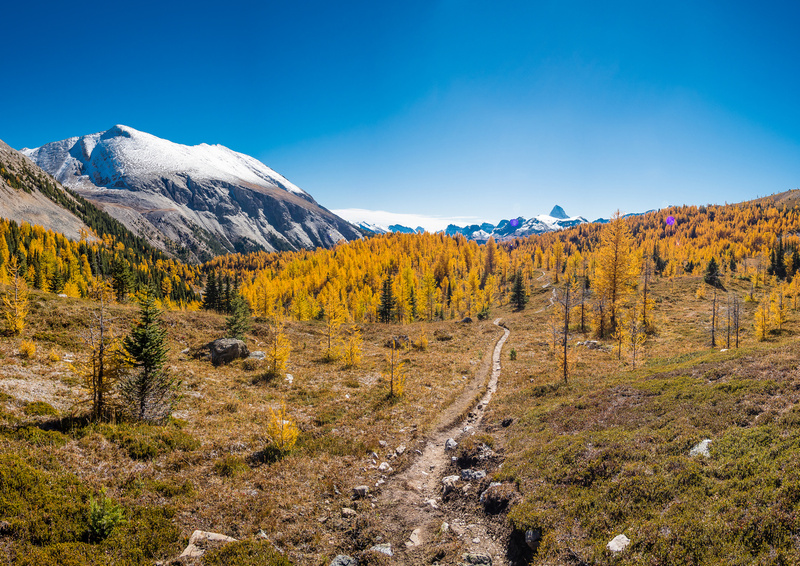 Finally up the first hill from the Sunshine Village and looking over the expansive Sunshine Meadows. The meadows were shrouded in low cloud but the larches were stunning and I knew that I was in for a gorgeous, scenic day even if there would be very little sunshine or blue skies. I’ve crossed the Sunshine Meadows before, on skies, and I knew there was a number of ups and downs along the way to Citadel Pass and thought I was ready for them. Of course, I wasn’t. With the number “400” meters stuck in my head for total height gain, I was again surprised by a significant height gain over the NE shoulder of Quartz Hill. I was already at 200m gain and wasn’t even close to Citadel or Fatigue Pass yet! Hmmm. 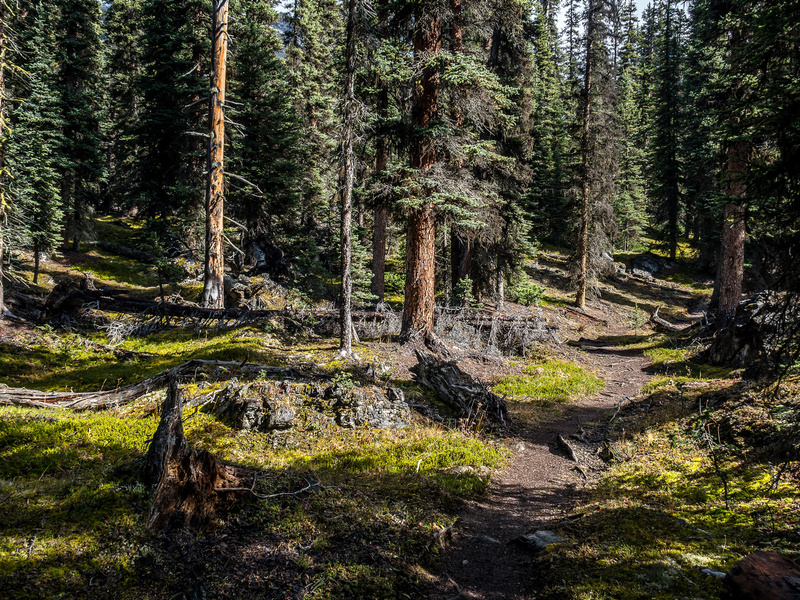 I slowed down slightly as I descended the steep and wet trail towards Howard Douglas Lake and campground. I was sweating already, early in the day. It was also raining on me intermittently as you can see from the water drops on the lens. 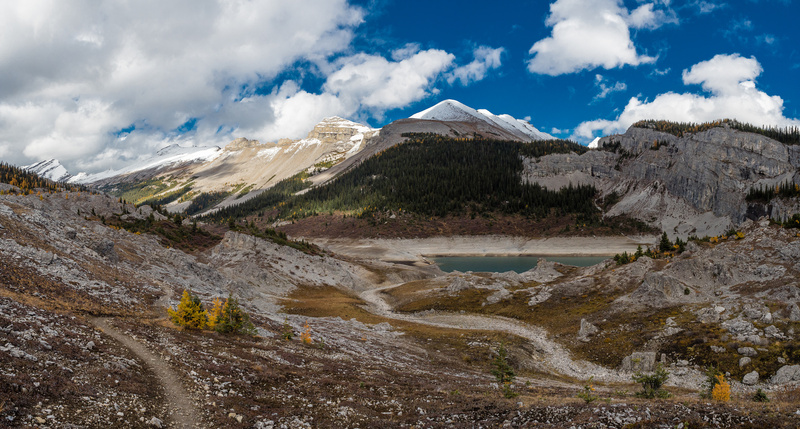 After slipping and sliding my way around Howard Douglas Lake and past an empty and eerily silent campground, I was faced with another climb towards Citadel Pass. I was completely alone in the swirling mist and clouds. 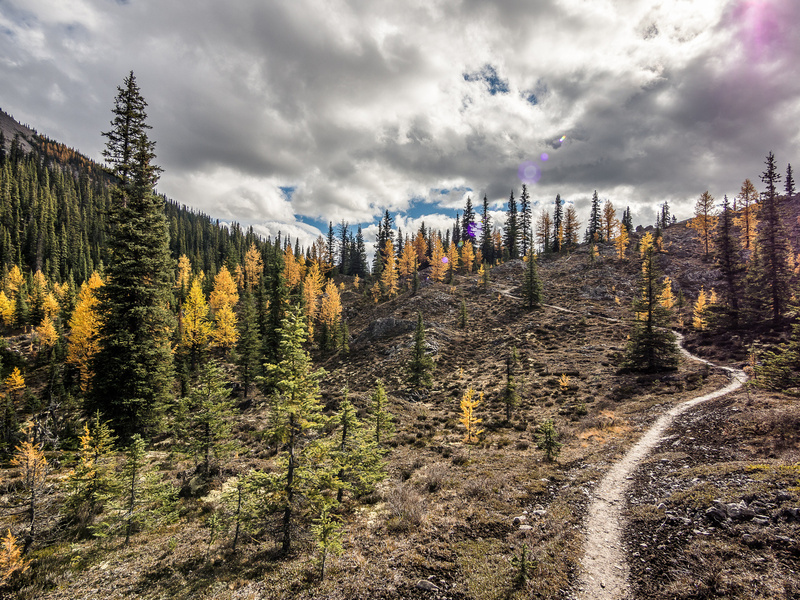 I have spent many hundreds of hours and kilometers in the backcountry by myself over the past 20 years and have learned to embrace the solitude. I grew up on a small farm and spent many hours alone as a boy. My mind tends to wander as I roam and I welcome the peaceful musing that solo travel affords. Our world is so connected nowadays that sometimes I feel we can’t turn it off and need the constant buzz and opinions of others to fill any silent holes that might open up in our day. I find that for me, silence is a good companion, often leading to insights and moments of peace that I wouldn’t otherwise have realized. 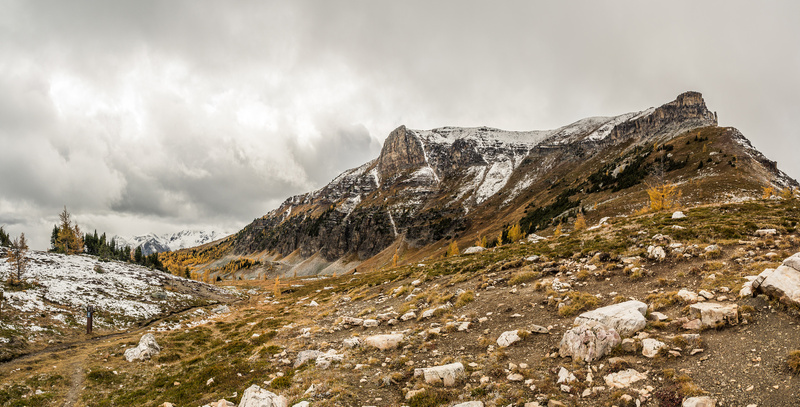 The Citadel Pass area is a pretty barren and windswept place located at the south end of Sunshine Meadows and under the east shoulder of Citadel Peak. Already at the pass, I had gone a few kilometers without any running water. It turns out I would do many more as Citadel Creek was my last source of running or clean water anywhere near the trail until Lake Magog! 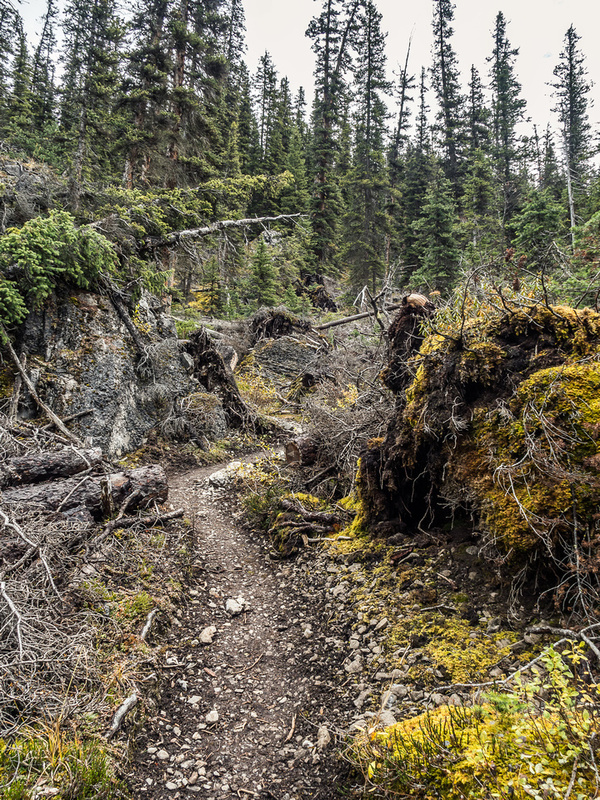 Hiking just a bit further I passed a dried up tarn and entered another thick larch forest, just west of Fatigue Pass, which is located south of Fatigue Mountain between it and Golden Mountain. The weather stayed moody as I prepared for the huge drop down to the Simpson River and Golden Valley. 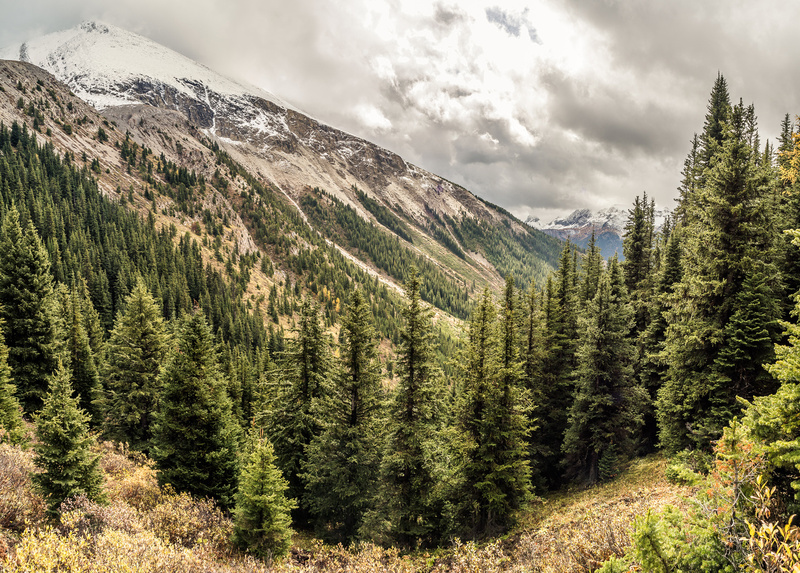 Soon after passing the dried up tarn the beautiful larch forest suddenly gave way to normal Rockies Evergreens and foliage and I found myself plunging very steeply down a major avalanche slope and narrow valley towards the Simpson River and Golden Valley to the south. It was here that I first realized there was absolutely no way the total height gain from the Sunshine Village to Mount Assiniboine Park was only 400m and I really began wondering what kind of day I was in for. 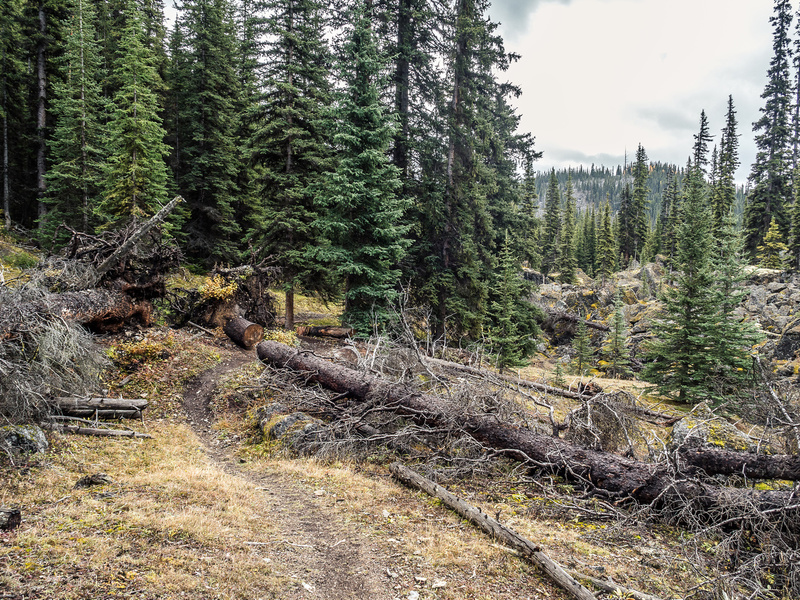 The rain was still falling intermittently as I hiked down the steep, muddy trail past HUGE Grizzly diggings in the neighboring slopes. I’ve never seen such aggressive bear diggings before. 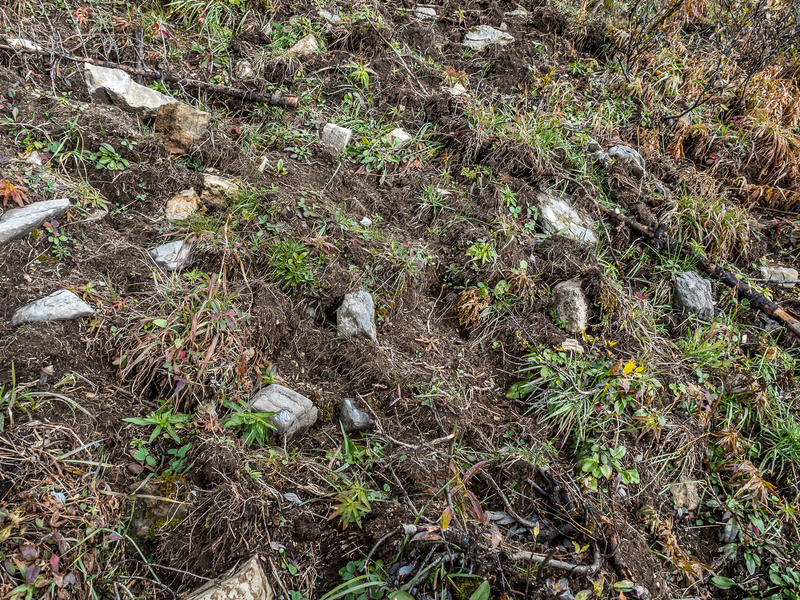 The entire slope looked like a rotor tiller had been used to mulch everything to a messy tangle of roots, grasses and rocks. 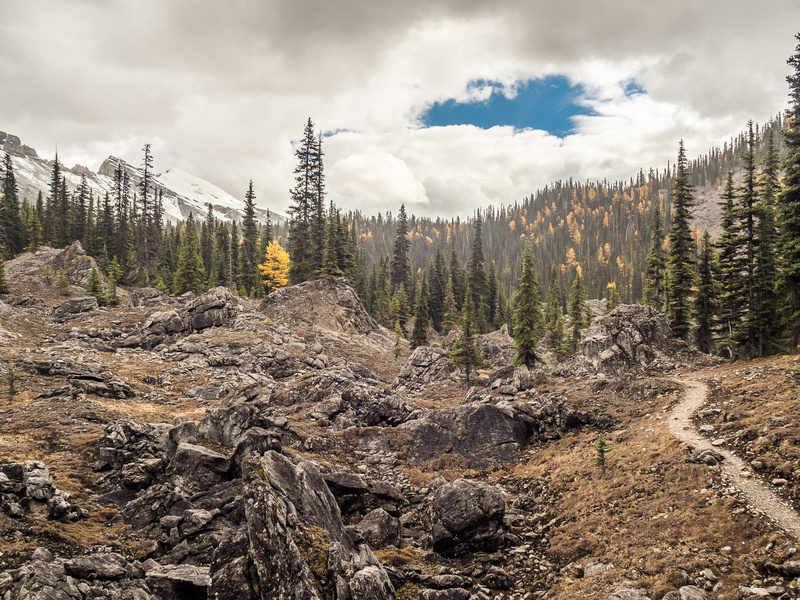 The combination of gloomy weather, fresh bear diggings and the fact that I was now at least 12km from any civilization emphasized my solitude as I made my way down the excellent trail. 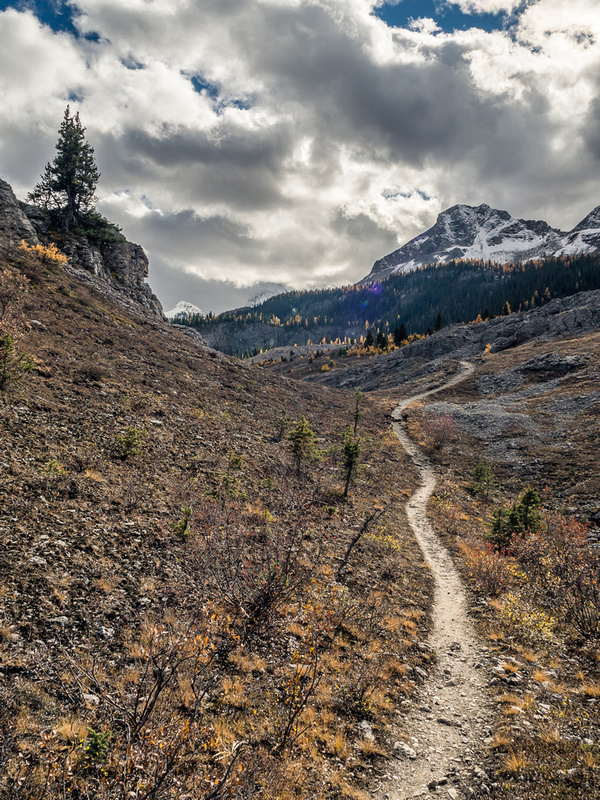 One of the highlights of the Sunshine approach is this section of about 1-2km where the trail cuts across a very steep, grassy slope high above the Simpson River (R) along the SW slopes of Golden Mountain (L). Eventually I exited the narrow valley and started a high level traverse around the SW end of Golden Mountain. This was a highlight section of the trail and probably my favorite part. 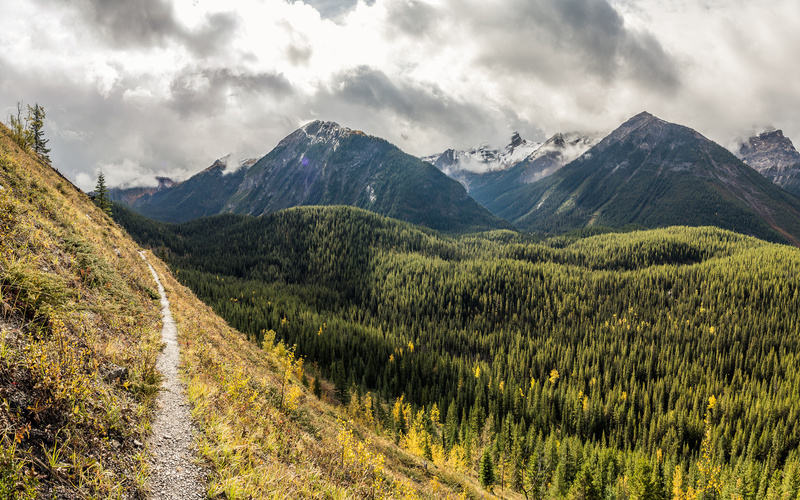 The combination of sun / cloud / rain on the surrounding peaks, along with the fantastic exposure down impossibly steep grassy slopes into the Simpson River valley on my right made for a short, magical hike. 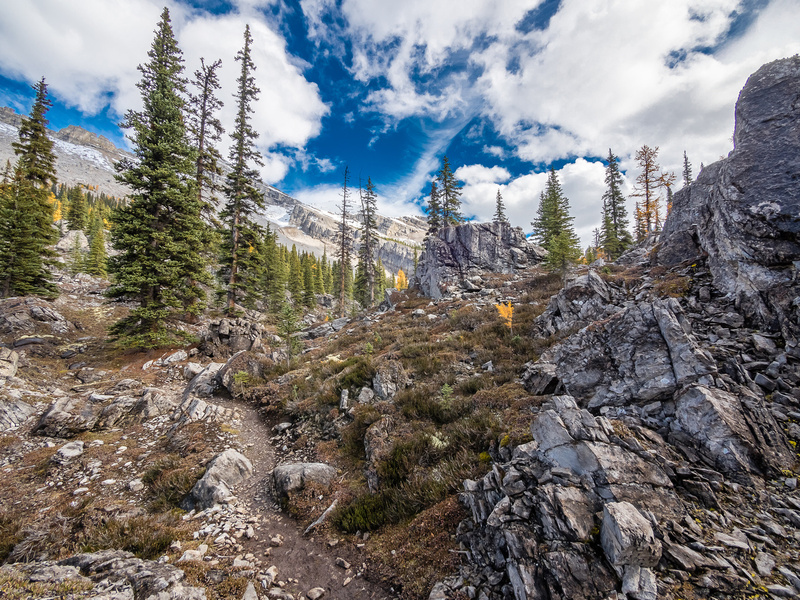 Near the start of this traverse there was a 1km option leading down to the Porcupine Campground which many folks use as a half way stopping point to Lake Magog. I walked through this camp on our way back from the Police Meadows in 2018 and it looked nicer than I was expecting based on trip reports I’d read previously. The Simpson River runs through here, providing fresh water. Mist and rain comes in towards me as I hike along an open section of trail coming into the Valley of the Rocks. 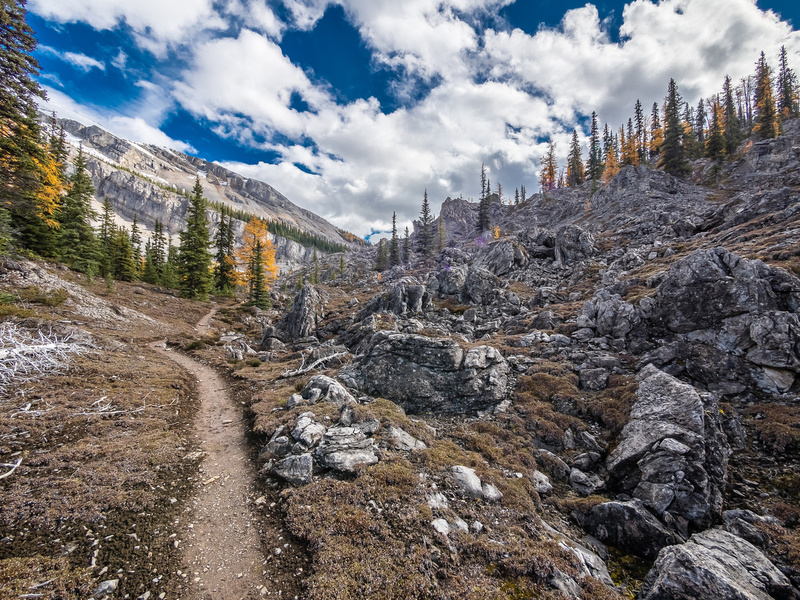 After the awesome high-line traverse, the trail dropped quickly to the right (south) into Golden Valley and I continued along it towards Og Lake and the Valley of the Rocks. 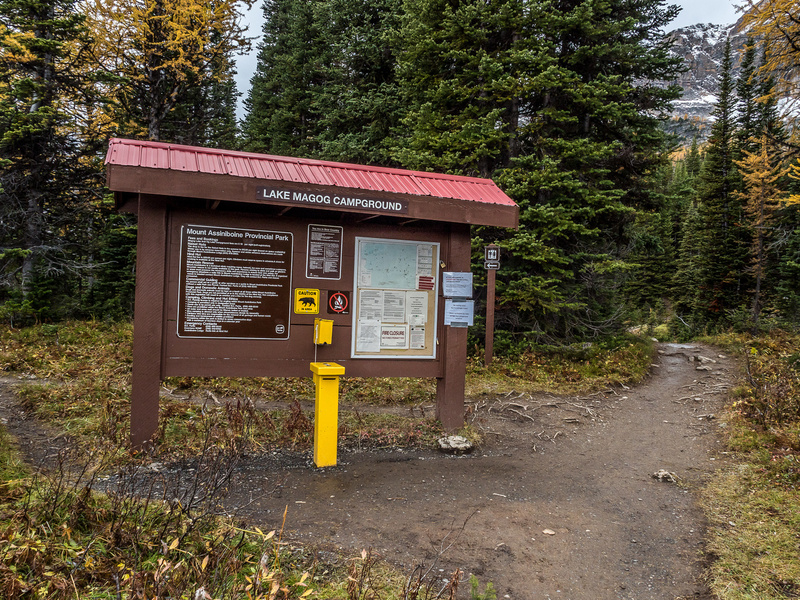 As I mentioned earlier, my last water source of any kind was below Citadel Pass where Citadel Creek crosses the trail on the Sunshine Meadows side and this situation continued for the entire length of trail to Og Lake – at least 13.5km with absolutely no water sources of any kind. 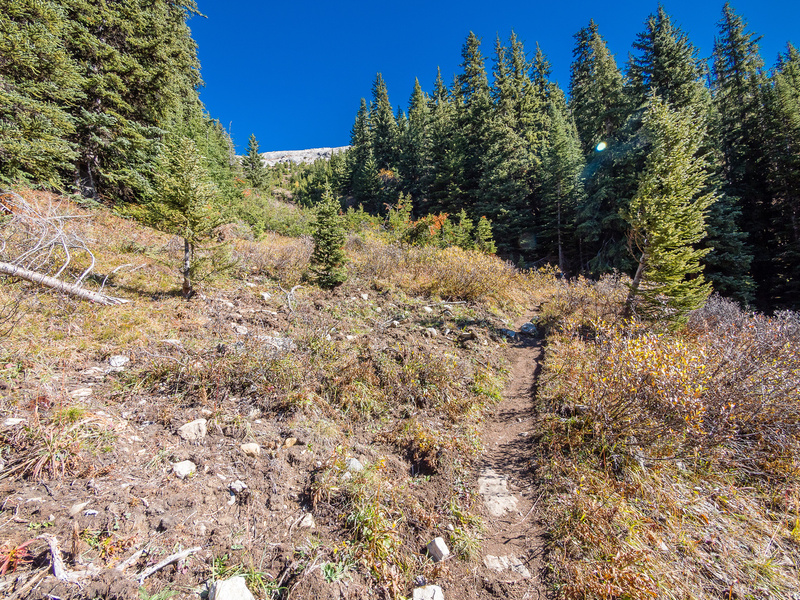 The map shows many little creeks intersecting the trail – these were all bone dry for me in late September. I’ve heard many stories of folks getting dehydrated on this stretch even in July and August so beware of this when you go. I actually went all the way to Magog without any water after that stream, so at least 18km! 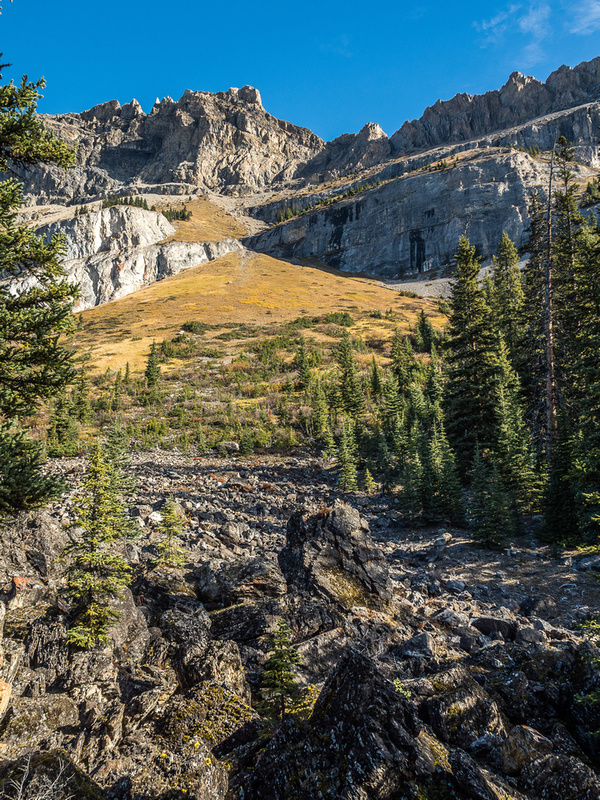 I am used to hiking with very little water as I hate carrying it and generally drink directly from water sources as I hike over or through them. Thankfully I had cool weather or I might have had hydration issues. On return, I made sure to carry about 1 liter of water on this section, which is a lot for me. I only used 500ml of it on a warm sunny day, which really ticked me off because I carried 500ml for nothing. The Valley of the Rocks is aptly named and another highlight of the trail. 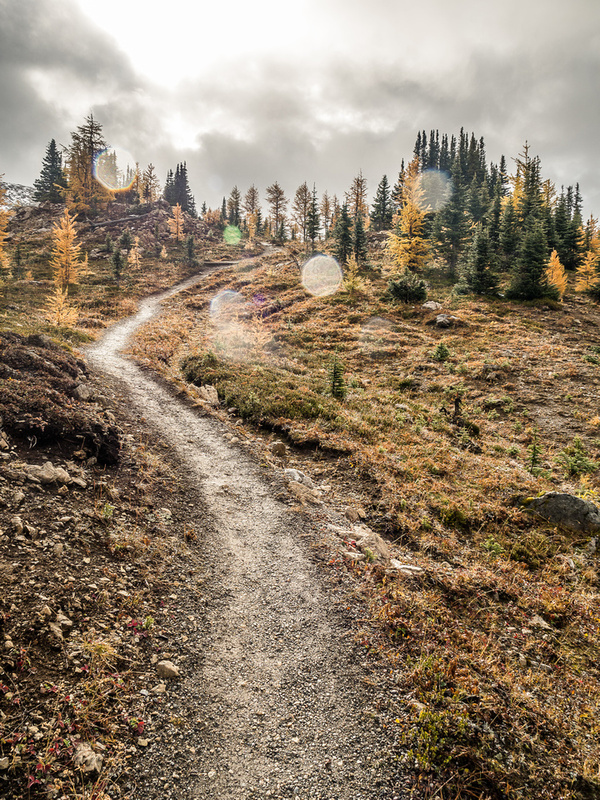 The one downer is the elevation gains and losses as the trail tries to make up its mind… and fails miserably! 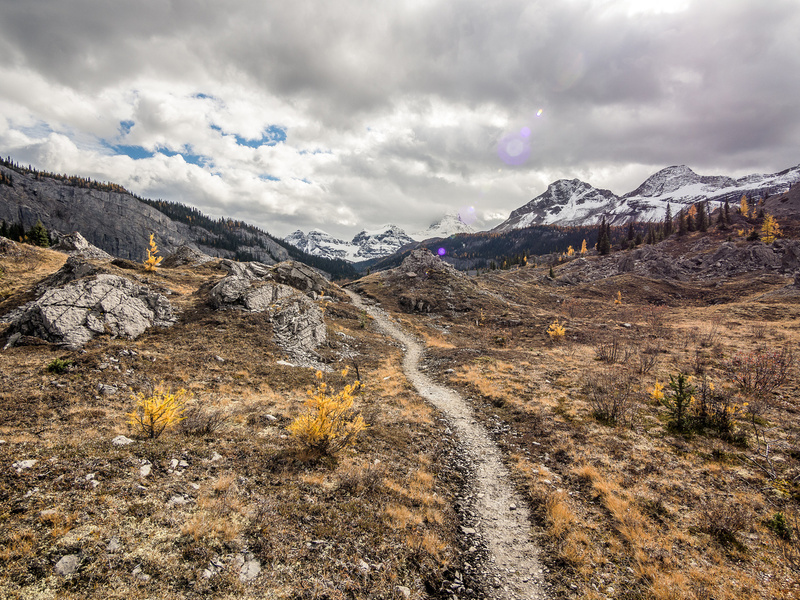 The clouds are starting to lift as the trail winds it’s way towards Og Lake. 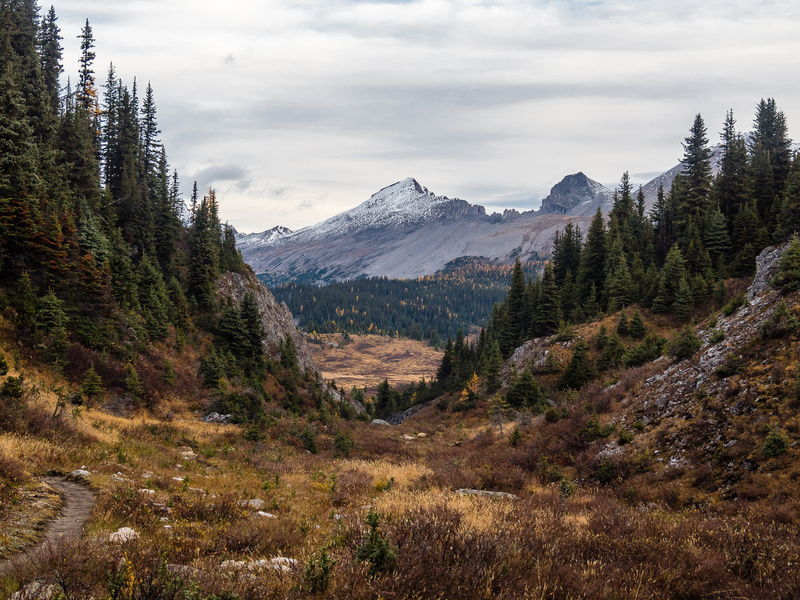 As I continued to gain and lose height through extremely scenic and interesting little valleys and passes through Golden Valley, I started to spot some familiar terrain. It’s not that I’d seen it before, but it matched what I was expecting and soon I realized I was looking at Golden Mountain and Nasswald Peak. This was great news as I knew that Og Lake was somewhere just past Nasswald. After what seemed like a long time and a lot of elevation change, thankfully through gorgeous landscapes, I spotted some familiar peaks. Windy Point Ridge and Og Mountain slowly came into view. Hiking past Og Lake and campground. I passed through the stunning Valley of the Rocks and eventually I found myself at a very empty and lonely Og Lake Campground and a shockingly low Og Lake. I thought I’d be able to easily get water at Og Lake, but I didn’t feel like hiking all the way down to the water, so I decided to have a quick bite to eat and push on the remaining 6.5km to Lake Magog. Maybe I missed it, but I didn’t see any other water sources around the campground at Og. Still a ways to go, but a sight for sore eyes (and legs! 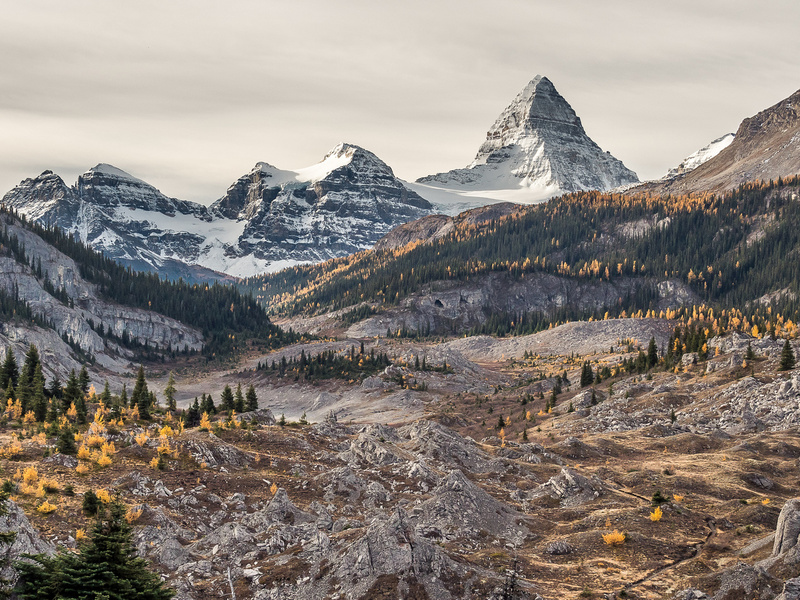 ), the core Mount Assiniboine area comes into view with The Towers, Naiset Point, Terrapin, Magog, Assiniboine, Wedgewood and Sunburst Peaks on the horizon (L to R). I’m not gonna lie. The 6.5km from Og Lake to the Lake Magog campground were long. Really long. My pack was basically a complete alpine pack with everything from ice ax to crampons to tent, stove, fuel and I was even carrying mountaineering boots (hiking in approach shoes)! It all fit in a 70 liter pack, but it wasn’t as light as I am used to carrying. 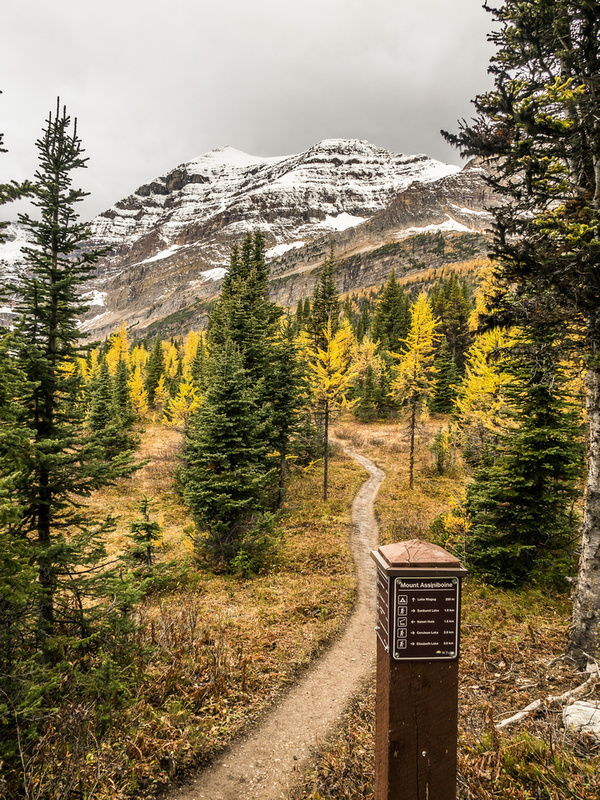 I had food and supplies for 5 or even 6 days so I was feeling it by the time I started seeing signs for the Assiniboine Lodge, Naiset Huts and finally the Lake Magog backcountry campground. The campground was a bit different than I was expecting. 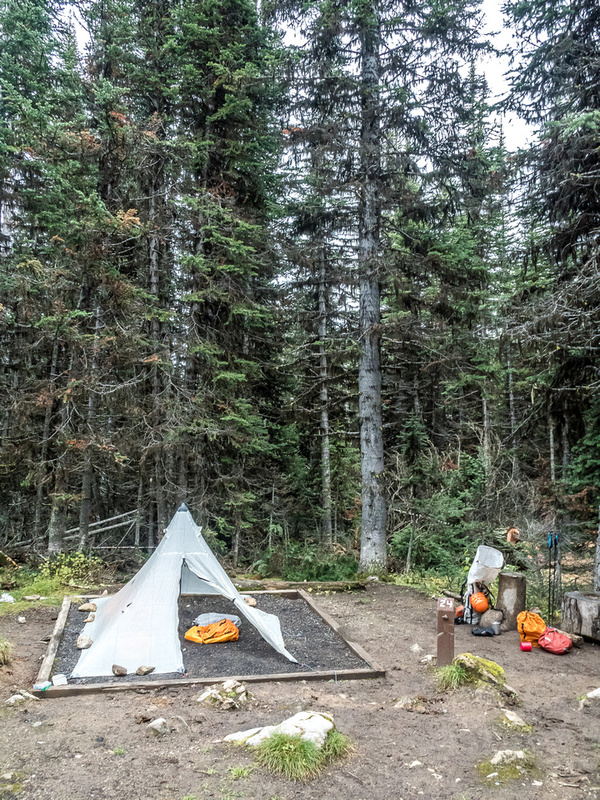 Rather than having the tent pads close together and views of its namesake, the sites are scattered throughout the forest and aren’t close to the lake at all. You can’t even see Lake Magog from the majority of the tent pads. Some of the sites are right beside each other. I picked an empty site near the cook shelter. The shelter was a bit of a disappointment. 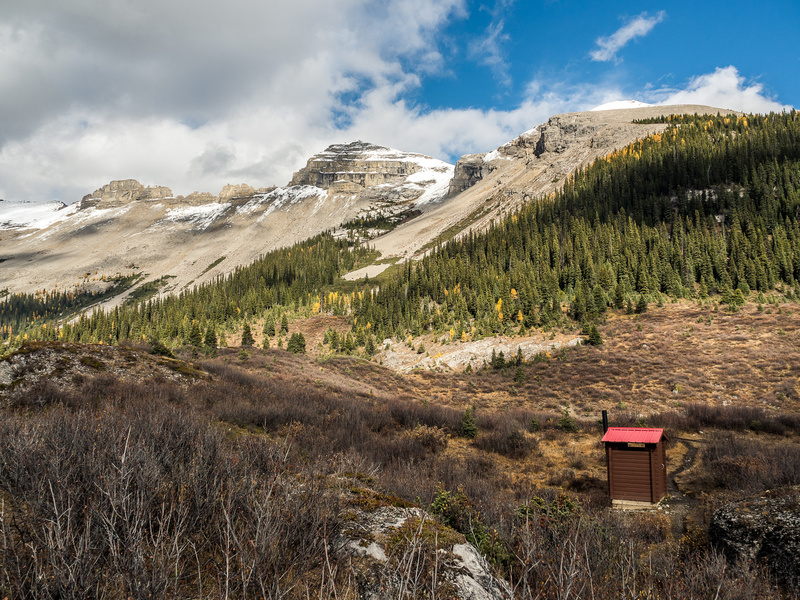 I was hoping for a covered shelter like the Hargreaves at Berg Lake in Mount Robson Provincial Park, but the shelter at Magog is wide open to the elements. All it really offers is a roof and 4 picnic tables, but absolutely no protection from wind or blowing snow – both of which I experienced in it. Oh well. I was surprised by the number of fellow campers at the Lake Magog Campground. At least half the sites were booked. 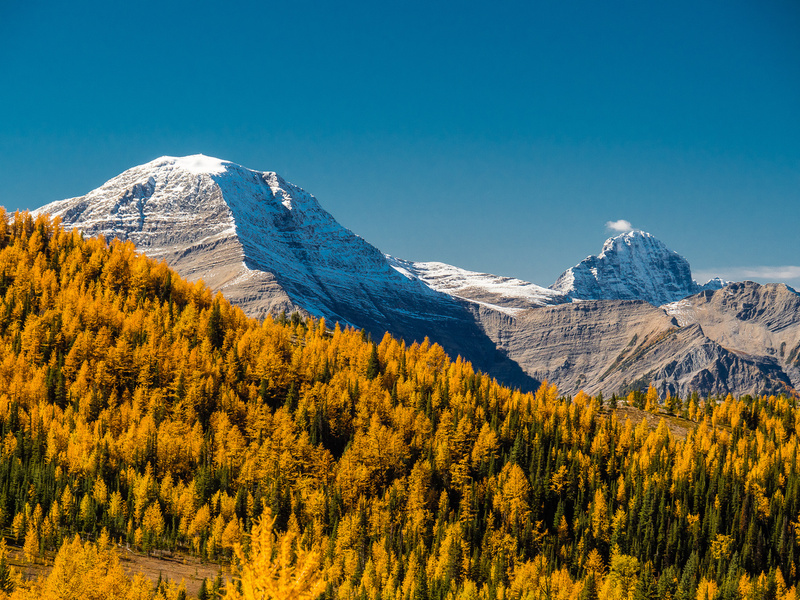 Apparently the Mount Assiniboine area larch season has been well documented on social media, mainly 500px and Instagram. Most of the folks I met were foreign tourists from around the globe including the US, Belgium, Austria and China, attracted by the idea of getting that one “winning shot” of Mount Assiniboine from the Nub. Many folks made multiple trips up the Nub each day to get that one iconic shot. 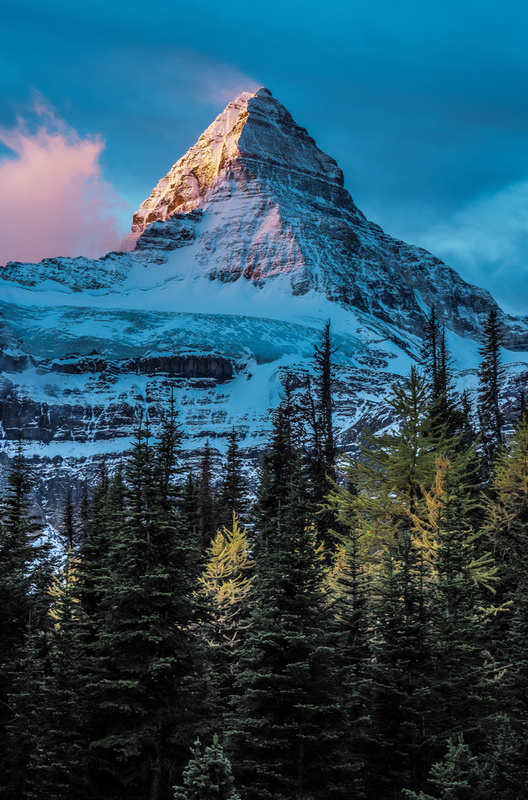 The poor Chinese party of at least 8, spent 7 days camping out, shivering in snow and waiting for the weather to finally clear enough to see Mount Assiniboine! It made me a little bit sad to see this beautiful area reduced to an IG moment or 500px hit. 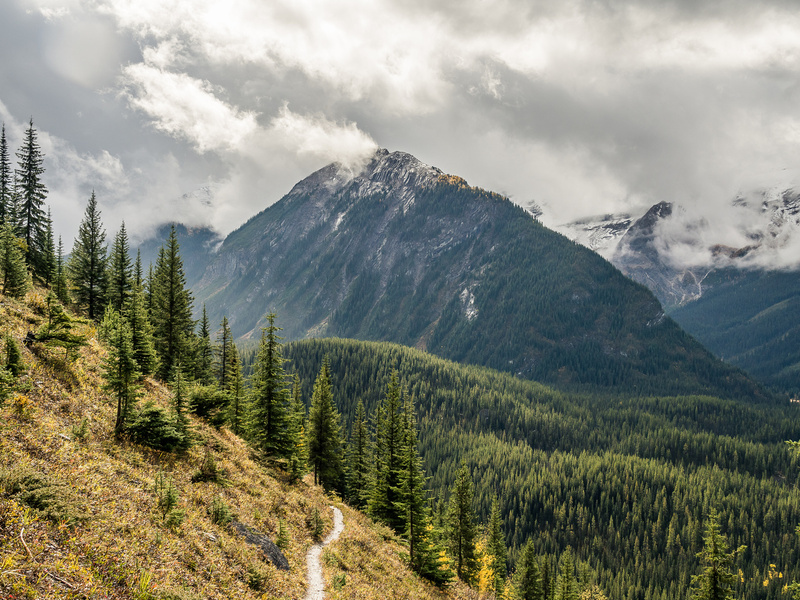 Of the tens of people I ran into in the next 3 or 4 days, only a couple were there to primarily spend time in the wild, hiking, scrambling and enjoying the outdoors for its own sake. I didn’t see anyone else scrambling peaks, and a lot of people spent the majority of their time just sitting around or walking between the many lakes in the area, waiting for the clouds to clear. Maybe that’s the normal life of a photographer and I just don’t understand it. Seems a bit boring to me. But again, to each their own! After a few days of peak bagging and hiking around the Mount Assiniboine area, I was ready to leave. On hindsight I could have stayed another day but the weather wasn’t cooperating quite how it was supposed to (not a surprise in 2016!) 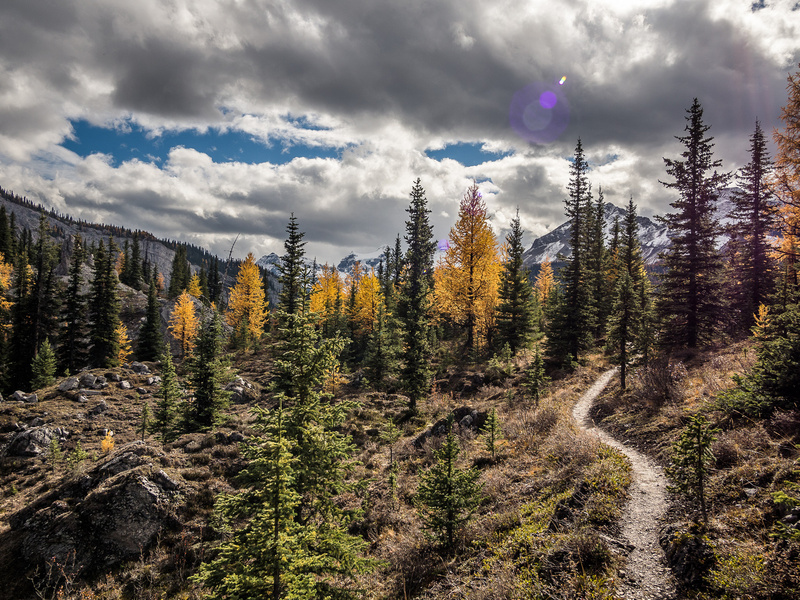 and I was tired of being cold all the time in the afternoons and evenings, so I decided to take advantage of a beautiful day to egress back up Citadel Pass and out to civilization via the Sunshine Meadows. 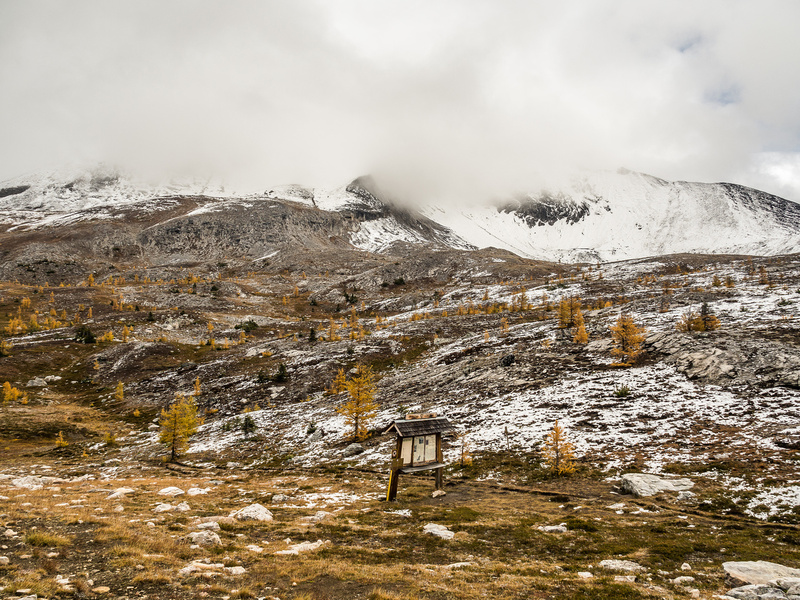 Waiting another day might have resulted in another cloudy, cool hike on return, and I wanted sunshine for my exit so I could really enjoy the larches and views around the meadows. As a side note – this is why a covered picnic shelter would be so much nicer at Lake Magog – it wouldn’t be so dang chilly sitting around for 4 or 5 hours each evening in late fall! I had a full 3 layers on, including Gore-Tex and winter down and was still shivering after reading my book for a couple of hours. Once again, I was surprised how many of the folks around me weren’t there primarily for the wilderness or the hiking experience, but mainly for the chance to get a winning photograph. There were only two others, who I met, who both hiked in and out of the area. 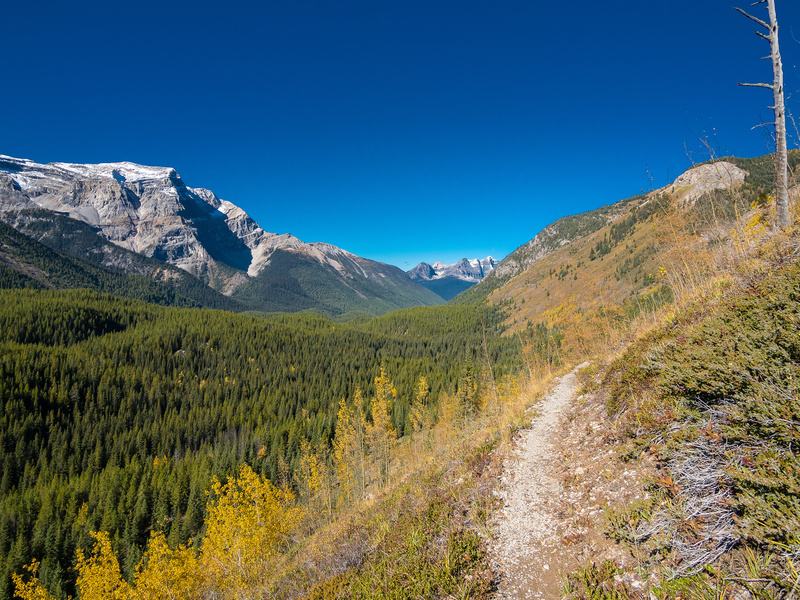 They were two Dutch backpackers who were on holiday in Canada and were hitting up many of the iconic Rockies trails including the Rockwall, the Tonquin Valley and others. They hiked in via Mount Shark / Bryant Creek and were hiking out via Sunshine Meadows the same day I was. Everyone else that I met either flew in and hiked out or hiked in and flew out or flew in and flew out. I did meet a few other two-way hikers at the Og Lake campground as I hiked back along it. 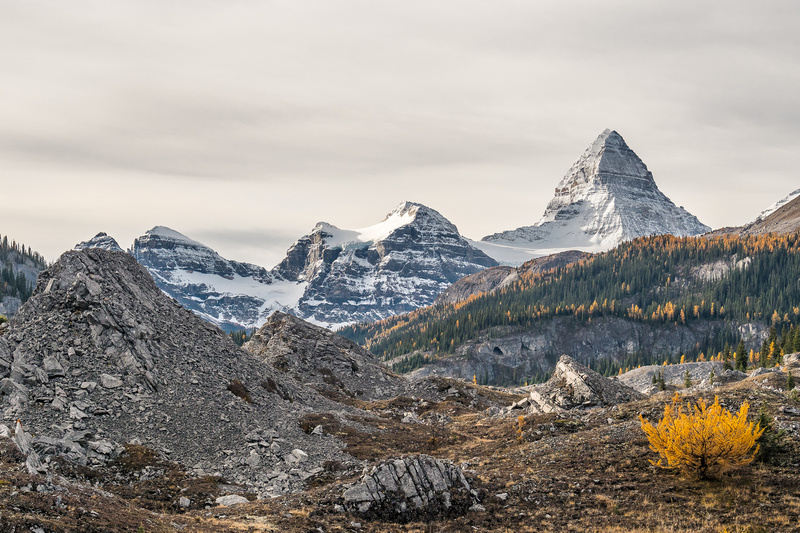 A wonderful view over the Valley of the Rocks back towards the mighty Mount Assiniboine from near Og Lake. 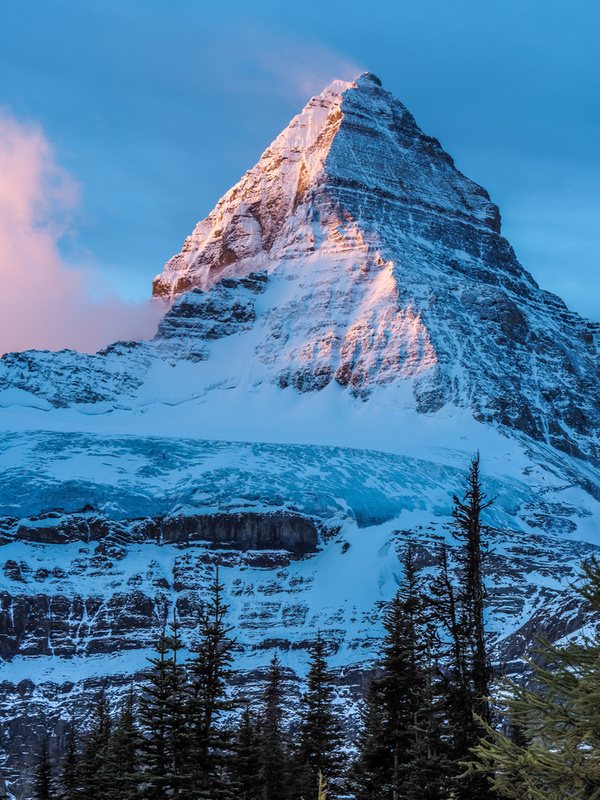 My exit day started out on a great note, with a beautiful sunrise on Mount Assiniboine. The photographers who’d made their way up the Nub at 03:00 (!!) were very satisfied, I’m sure! I got up at around 05:30 and spent a few hours slowly packing up camp, eating breakfast and loading up on coffee. Just after sunrise, I walked out of camp, ready for the long day and another ~1000m of height gain. 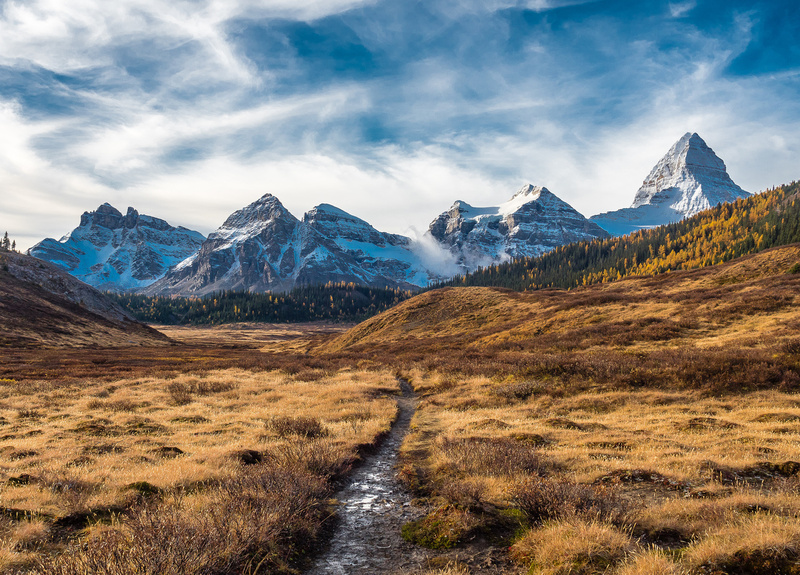 The biggest drawback of both approaching and departing the Mount Assiniboine area via Sunshine Meadows is that the height gains and losses are almost identical whether you’re coming or going. I didn’t fully realize this until I did it myself. All the other approaches are mainly gaining height on approach and losing it on egress, which is much more in line with what you’d expect. 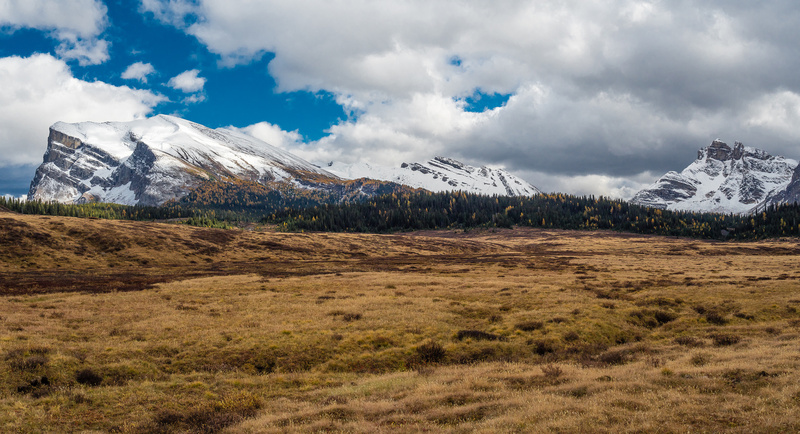 As I wandered back through the Og Meadows I was hyper-alert for Grizzlies in the area. Of course, this was partly due to my face-to-face encounter the day previous. I wasn’t nervous, but I was very alert and did a fair amount of warning yells on my way to Og Lake. As expected, the first 6.5km went by pretty quickly and I didn’t see a single Grizzly. 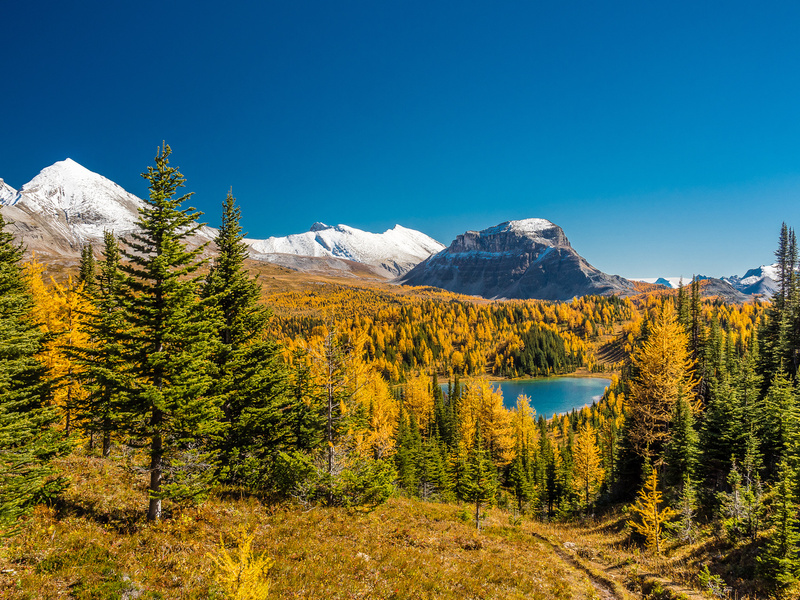 Mount Assiniboine rises over a larch forest from near Citadel Pass. Back at Og Lake, I was surprised to see a number of tents. On my approach the campground was completely deserted and it looked like there was no easy way to get water there, as the lake was half dried up and the water line was far below the campground. I chatted briefly with a group having breakfast and almost delayed my exit by a day for a chance to bag Windy Point with another solo hiker. I figured I’d be back some day for Nasswald and Golden anyway and Og Lake is the perfect base for those peaks. When I found out that there were two hikers about 30 minutes in front of me (the two Dutch backpackers), I figured I’d continue on by myself and see if they needed a ride back to their vehicle at the end of the day. (They were parked at the Shark Mountain lot and would need a lift from Sunshine to their rental car.) I was prepared for the long Valley of the Rocks and Golden Valley roller coaster so that section of trail no longer wore me down as much as it did on approach. 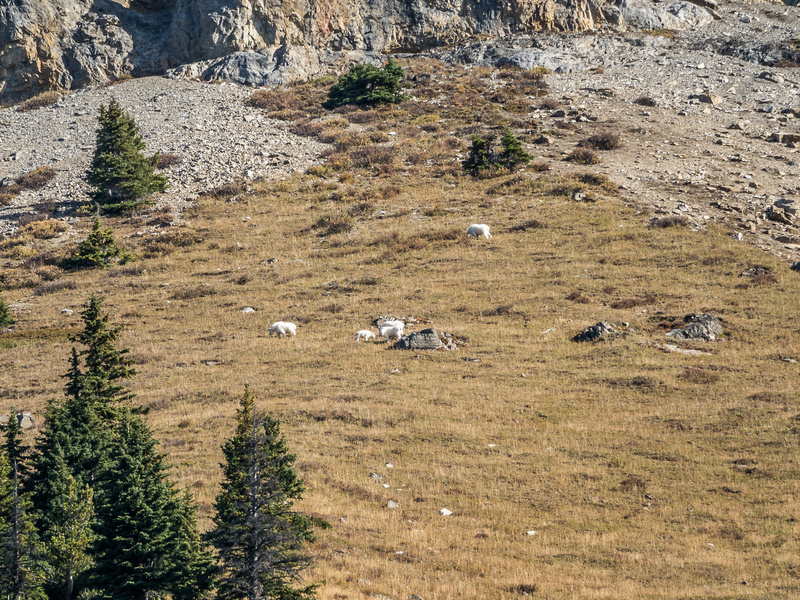 Spotting mountain goats high above the high-line trail was a bonus. The traverse across the steep SW slopes of Golden Mountain was very nice in the warm, morning sunshine, with great views of Simpson Ridge and towards Mount Shanks. From near Citadel Pass, looking over Citadel Lake towards the Ball Range with The Monarch and Quartz Hill on the right. 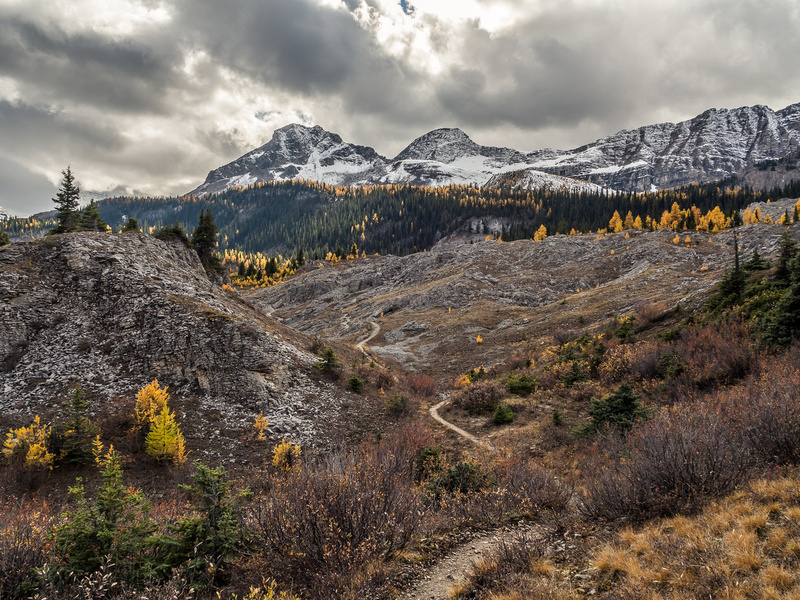 The steep grunt up past Fatigue Pass and towards Citadel Pass via the Grizzly Bear Heaven Valley was just as much work as I expected. Under a warm sun and with tired legs, it was a bit of effort, but I made pretty short work of it and was delighted to spot larches again – which meant I was near the top! 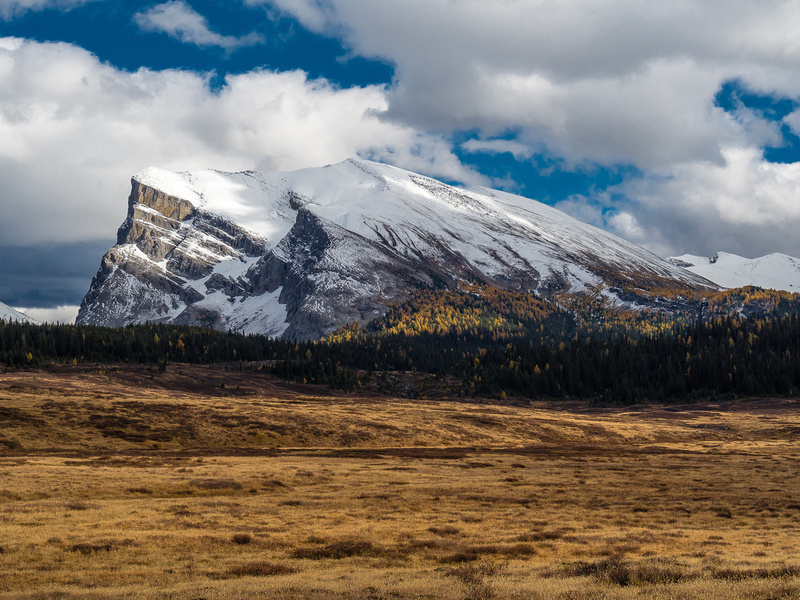 The highlight of the day for me was from Citadel Pass and across the Sunshine Meadows. What a gorgeous place to be on this perfect fall day. Quartz Hill just right of center – the trail goes up the high shoulder to the right of it. 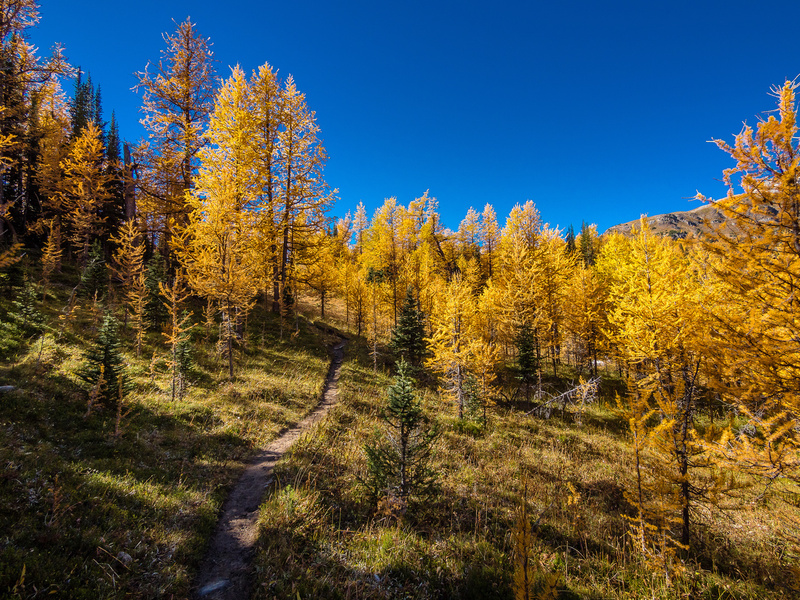 The larches were absolutely brilliant under the clear, blue skies and the warm weather made hiking very pleasant compared to what I’d done the three days previous. 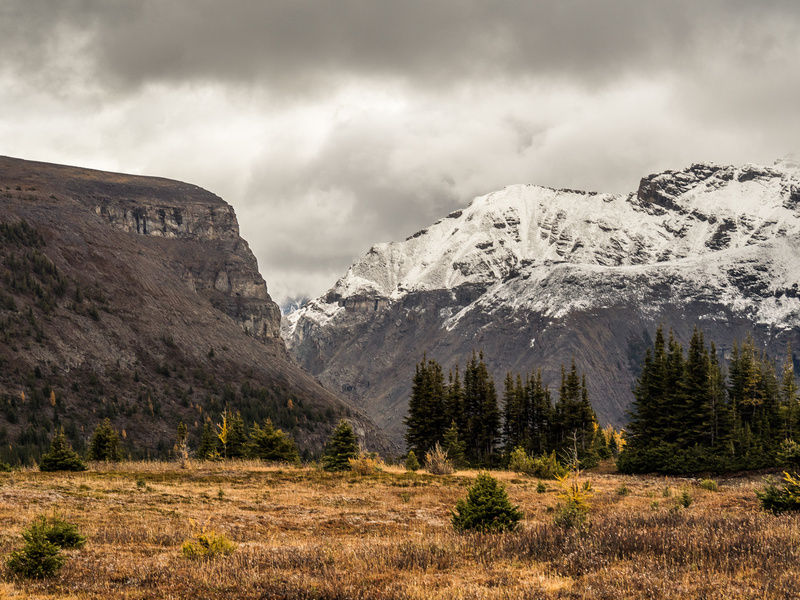 This is the weather I was expecting the entire time in the Mount Assiniboine area! It sure would have been nice for the Cautley traverse, but oh well. Sometimes you just don’t get lucky with the weather in the mountains and in 2016 this was par for the course rather than the exception. 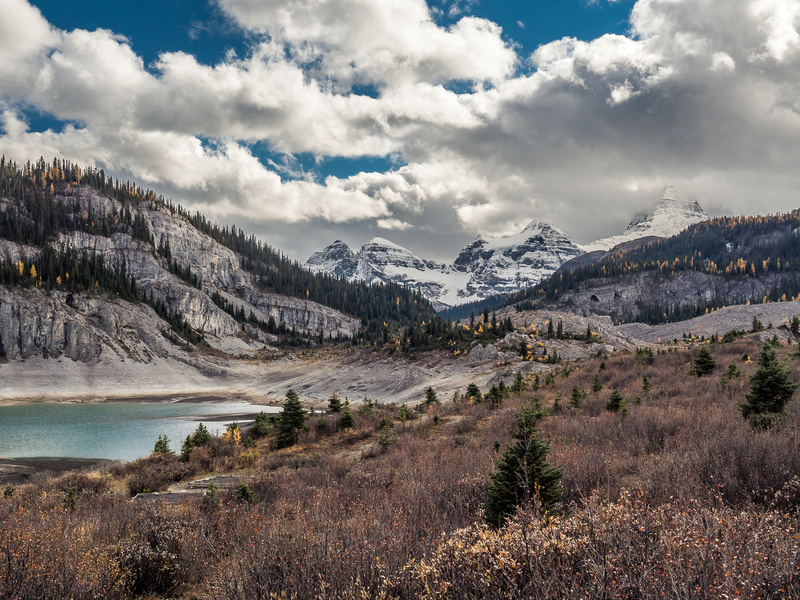 Looking back over Howard Douglas Lake towards Fatigue (L), Citadel Peak (C) and Mount Assiniboine (R). My trip concluded with an interesting side story. I was surprised all day that I wasn’t catching up to the two Dutch backpackers. Not to brag, but after hundreds of kilometers of hiking and scrambling over the last half of the summer, and a TON of elevation gains, I was in pretty darn good shape. I really thought I’d catch two “flat landers” from The Netherlands pretty easily, considering they were only 30 minutes in front of me from Og Lake. As it turns out, I was literally trying to catch up with an Olympic athlete!! OOPS. 🙂 I met the two just in time to catch the 15:30 bus to the parking lot from the Sunshine Village. They were super happy when I offered them a ride back to their vehicle which was parked at the Mount Shark trailhead. We had to stand on the bus, thanks to a capacity crowd, and after conversing for a few minutes I realized that the woman I was talking to – Inge Janssen – had just won a silver medal in rowing at the Rio Olympics – not more than a month earlier! I enjoyed a great conversation with Inge and her friend as I drove them to the Mount Shark trailhead. It turned out that she was taking a break in the Canadian wilderness to rest after a busy Olympics and decide what to do for the next four years. 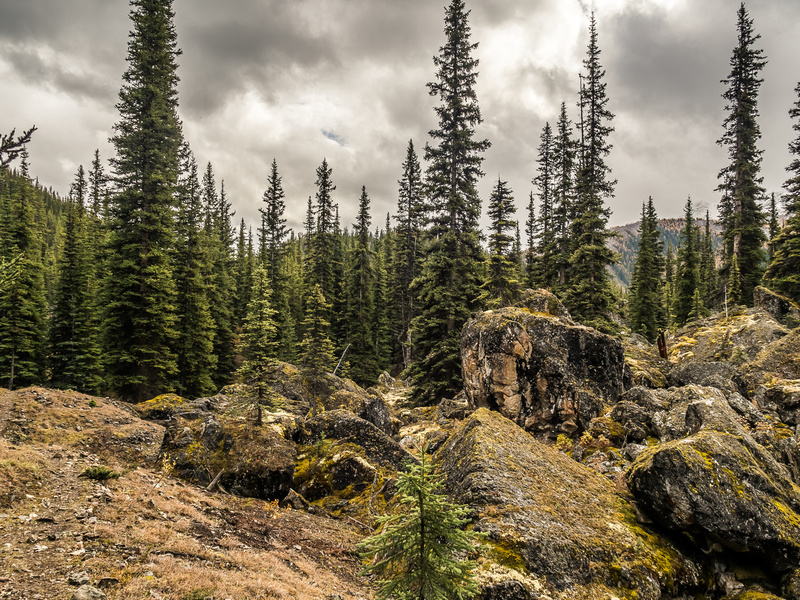 I had to agree with them that there is no better way to de-stress than out in the silent wild of the Canadian Rockies. Looking back towards the resort as I start my trek. Looking across the meadows. 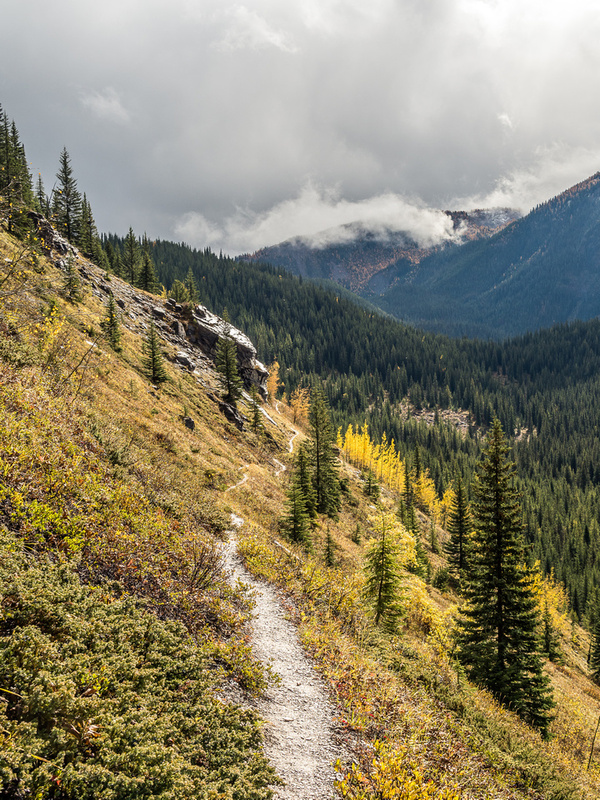 The route eventually climbs the shoulder directly above the foreground trail that comes off of Quartz Hill which is buried in clouds at right. 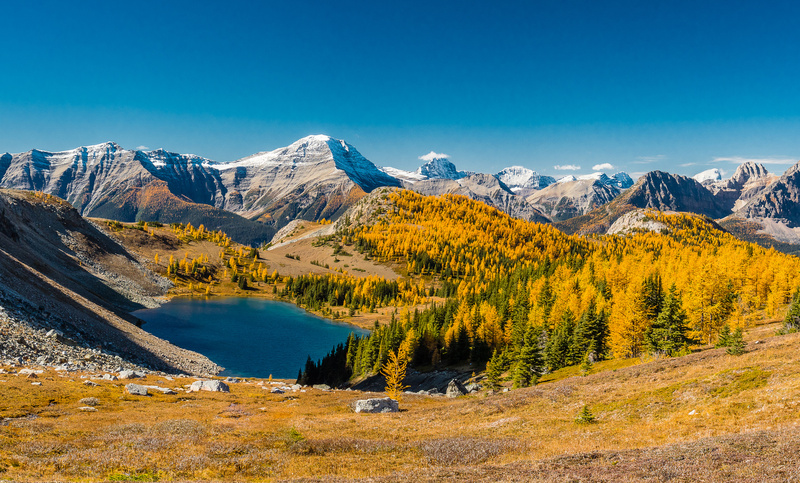 Sublime views over Howard Douglas Lake towards Citadel Peak. The pass is just left of the peak with Fatigue Mountain hidden in clouds to the left of that. 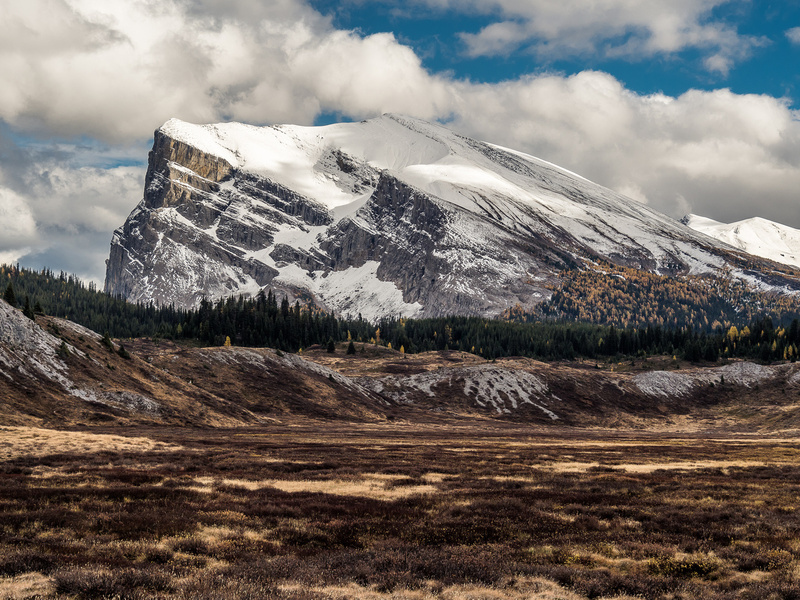 At Citadel Pass with Citadel Peak rising above. 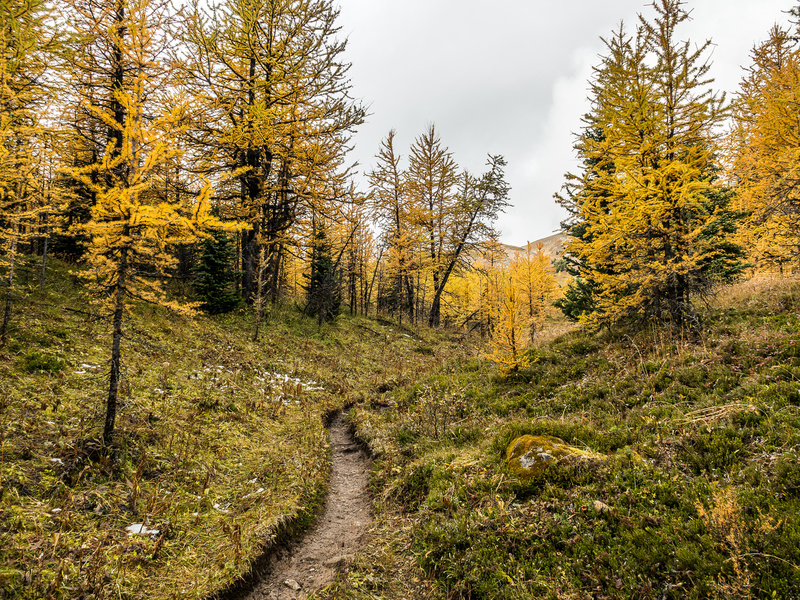 An intense larch forest as I work my way around the dried up tarn and towards the south end of Fatigue Mountain and an outlier of Golden Mountain. Looking down the tight valley running south of Citadel Pass and west of Golden Mountain down to the Simpson River and Golden Valley - about 3km from here. The entire slope was rotor tilled by a bear - and by the damage done, I would guess a pretty darn big one! The trail contours around Golden Mountain heading southeast until is plunges south directly into Golden Valley below. Entering Golden Valley on a good trail that is obviously well maintained. Interesting terrain in Golden Valley. 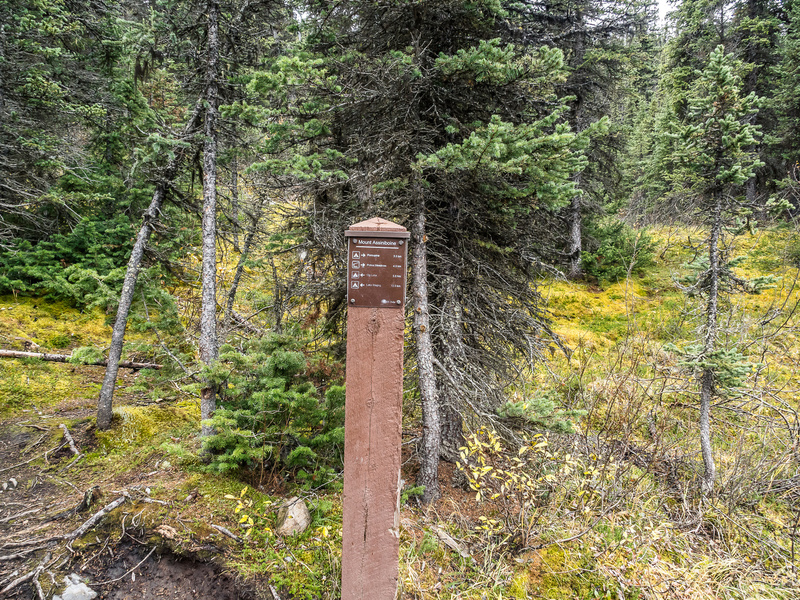 The trail branches to Police Meadows (L), running along the Simpson River and coming up from Porcupine Campground. 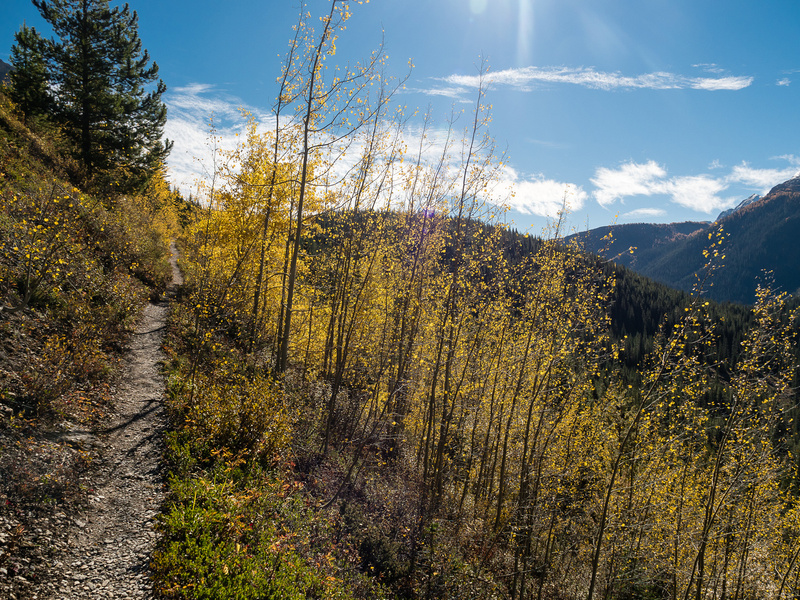 The trail through Golden Valley is very well maintained. 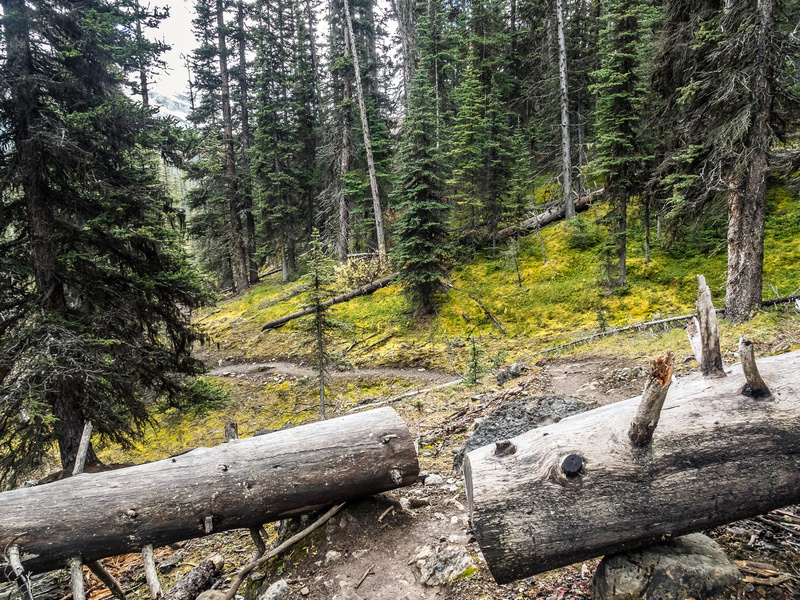 More evidence of good trail maintenance. Mist and rain comes in towards me as I hike along an open section of trail coming into the Valley of the Rocks. But there's a sucker hole in the clouds! 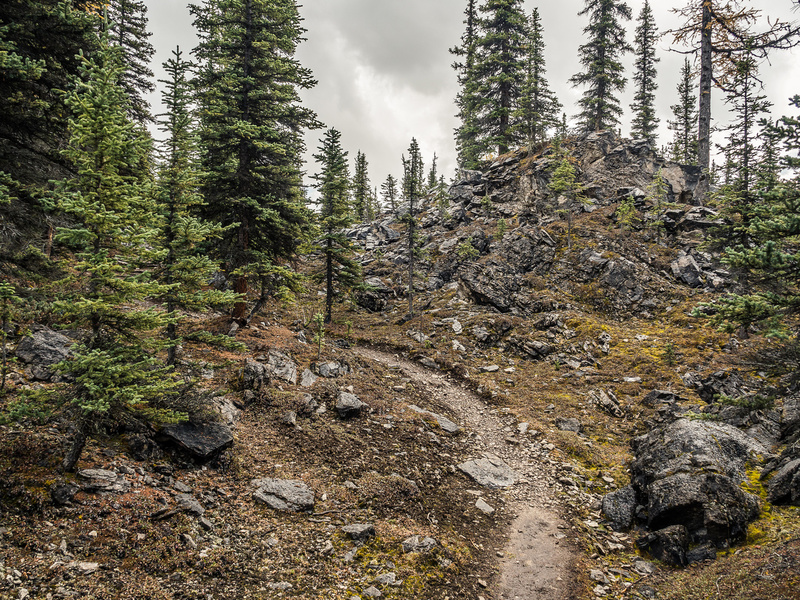 he trail stayed pretty solid even with the rain, thanks to a firm base and obviously very rocky terrain. A rare moment of pure sunshine. The Valley of the Rocks is aptly named and another highlight of the trail. The one downer is the elevation gains and losses as the trail tries to make up its mind. More Valley of the Rocks landscape. 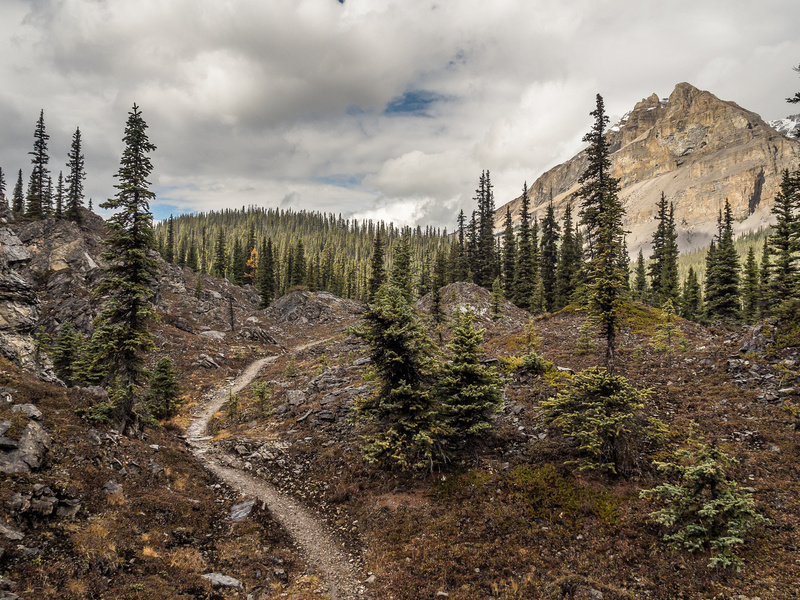 The clouds are starting to lift as the trail winds it's way towards Og Lake. Passing the Og Lake Campground. Leaving Og Lake, looking ahead towards The Nub. Looking back towards Og Lake with Golden Mountain at far left just showing up and Nasswald left of center. Windy Point and Og Mountain are at center. 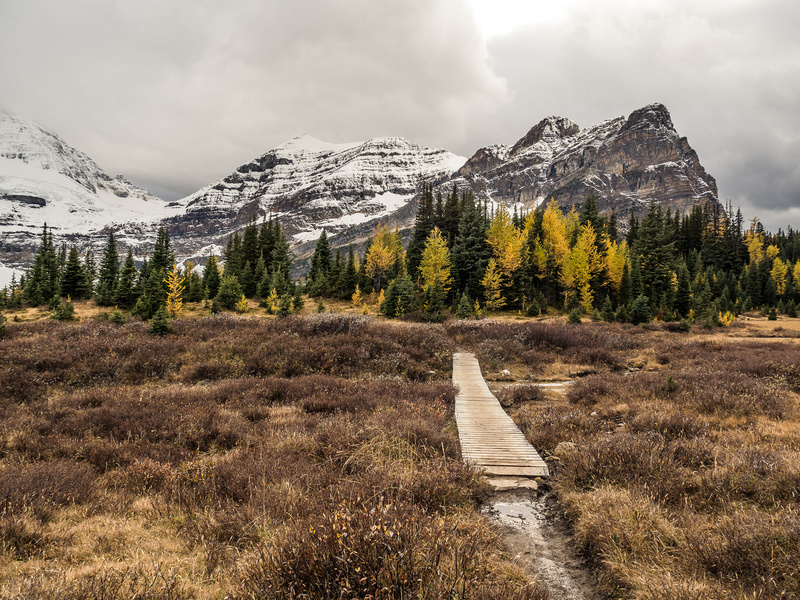 Looking forward through "the gap" into the Assiniboine Meadows. The Towers are rising in the far distance through the gap. Looking back at Windy Point Ridge (L) and Og Mountain (R). Great views ahead to Cascade Rock and Mount Cautley on the left, Ely's Dome and Wonder Peak at center and The Towers at right. Cascade Rock / Mount Cautley. Nice afternoon lighting looking past Cascade Rock (R) towards Mount Mercer. Looking back at Og Meadows with the trail towards Windy Point Ridge and Og Mountain going right and the approach from Og Lake at left. Sunburst Peak living up to it's moniker. t's basic, but it works pretty well. 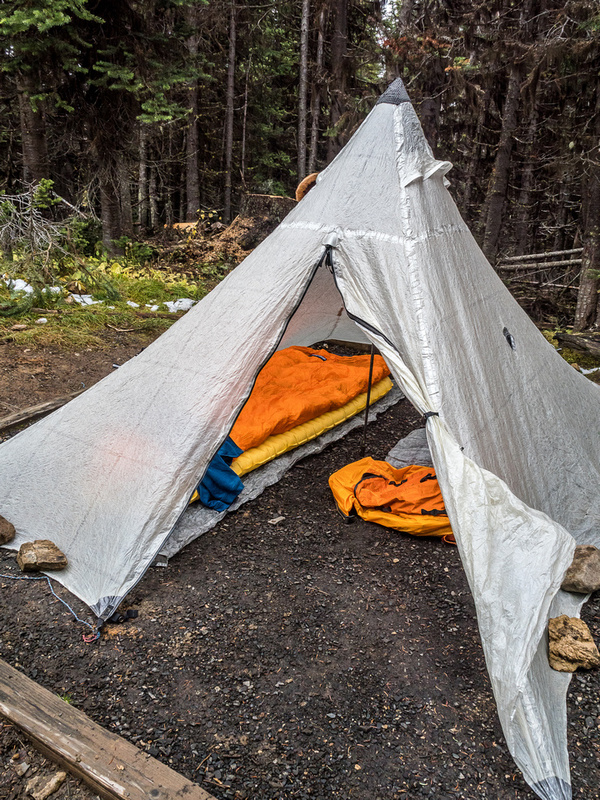 And even though they won't make me a gear ambassador, I'll plug once again for the Hyperlite Mountain Gear UltaMid shelter. 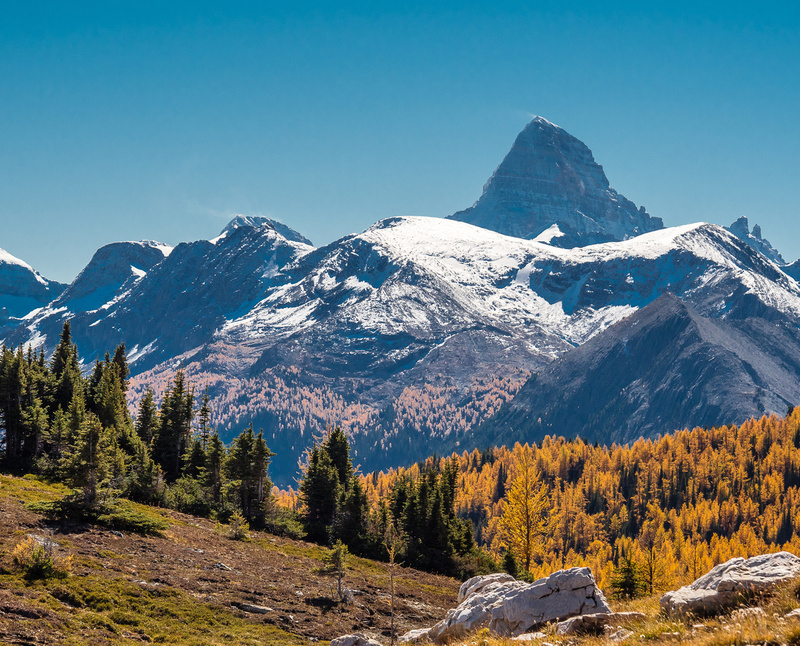 The gorgeous Matterhorn of the Rockies rises over the surrounding area like a king. Heading back through "the gap" to the Og Meadows with Nasswald almost completed melted off now. Looking back at The Towers, Naiset Point, Terrapin, Magog and Mount Assiniboine (L to R). 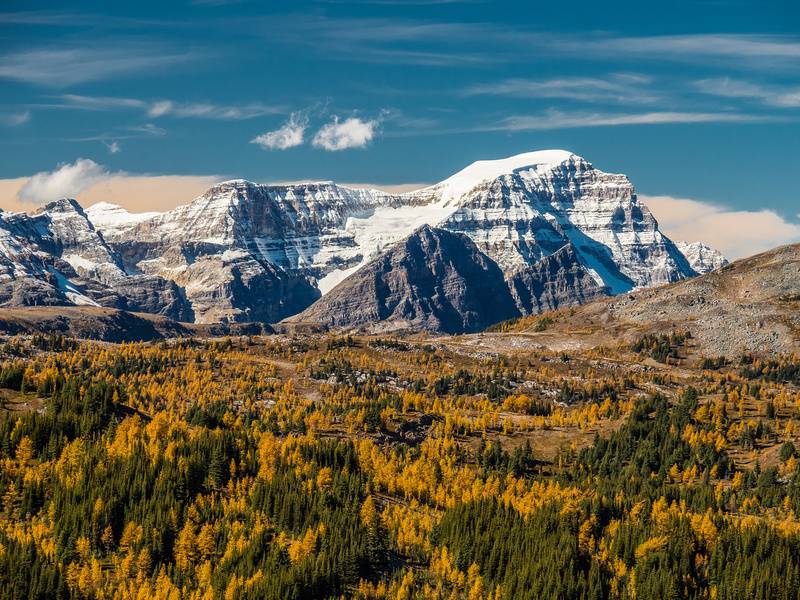 A wonderful view over the Valley of the Rocks back towards the mighty Mount Assiniboine. 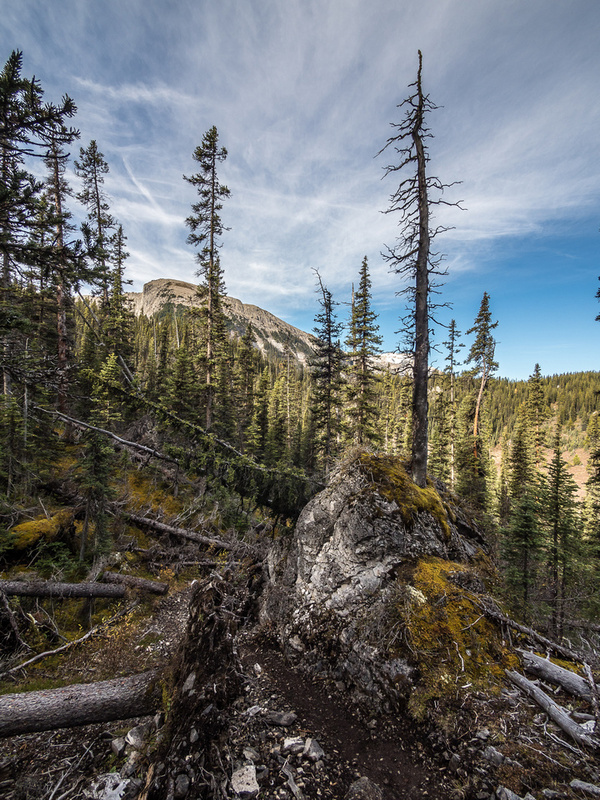 In Golden Valley, trees grow straight off the top of some of the boulders along the trail. How many years does that take? There they are! Happily grazing high above the high line trail on the SW slopes of Golden Mountain. The highline traverse along the southwest slopes of Golden Mountain is just as nice as I remembered it from the approach. The rotor tilled Grizzly Bear slope was just as intimidating as I remembered. 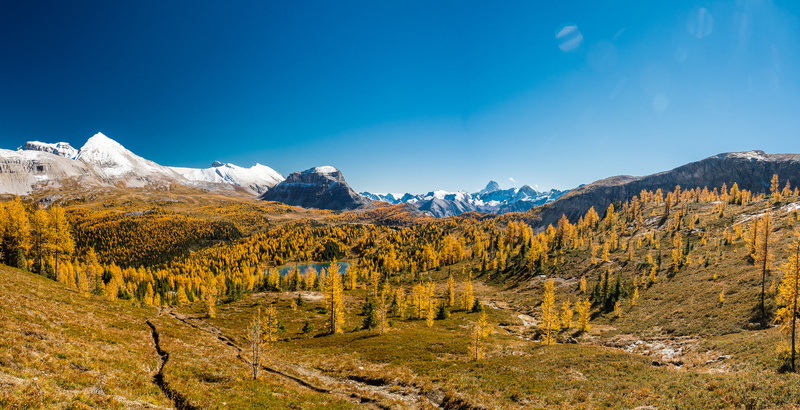 Larch brilliance from near Citadel Pass, looking back towards Mount Assiniboine in the far distance and Golden Mountain rising at left. 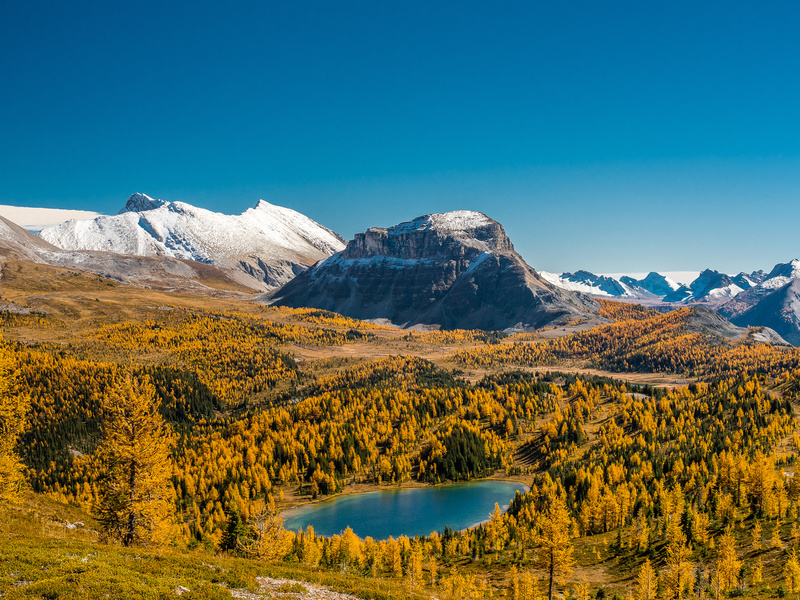 The mighty "A", Mount Assiniboine, and a larch forest. 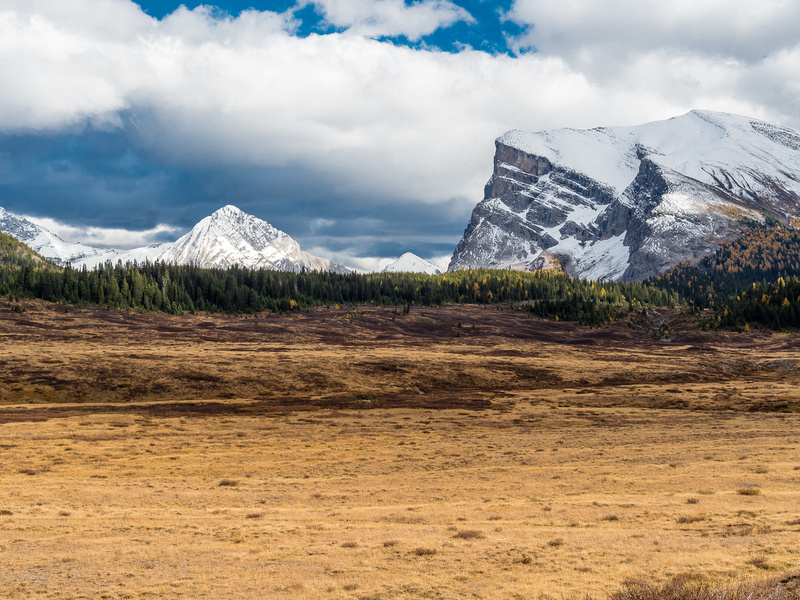 Mount Shanks on the left with Verendrye on the right. Quartz Hill just right of center - the trail goes up the high shoulder to the right of it. 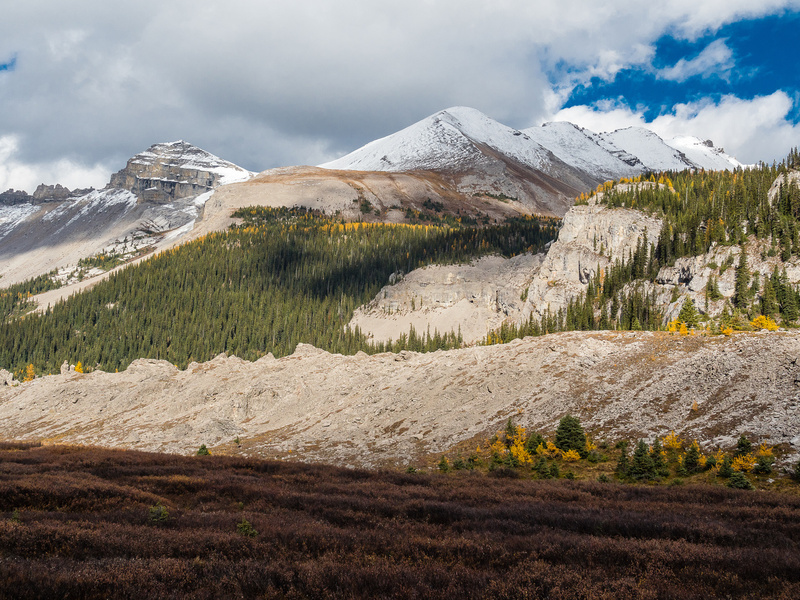 Mount Ball looms over Greater Pharaoh Peak and Healy Pass. Looking back over Little and Big Fatigue.